Muscle biopsy often contributes significantly to the evaluation of patients with neuromuscular disease. 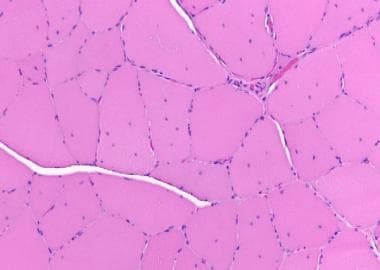 Knowledge of the fundamentals of muscle biopsy pathology is useful to promote understanding of the pathogenesis of many types of neuromuscular disorders and assists the non-pathologist clinician to understand reports that he or she receives for the muscle biopsies from his or her patients. Knowledge of the basic foundation of muscle biopsy also helps the clinician to understand in what situations a muscle biopsy would be expected to be helpful in assessment of the patient with neuromuscular disease and to be familiar with the types of information that it can provide. 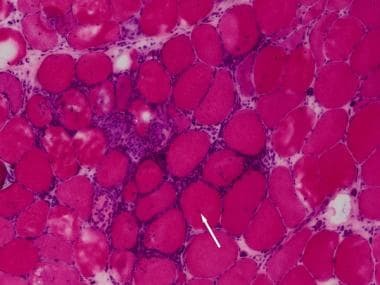 This article is intended to provide an introduction to the pathology of skeletal muscle biopsy and present the pathological features characteristic of certain disorders; this will not present instruction on the subtleties of advanced muscle biopsy diagnosis. 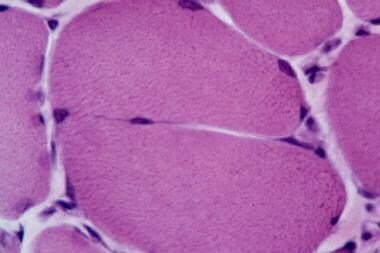 This article first presents and contrasts neurogenic and general myopathic features on muscle biopsy. 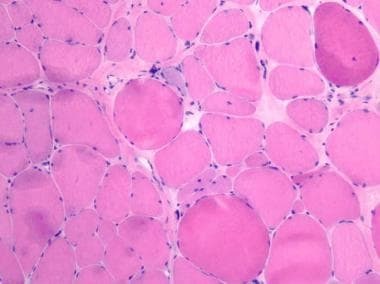 The remainder of this article addresses the key clinical characteristics and pathologic findings on muscle biopsy of selected examples of disorders from 4 different categories of muscle disease: immune-mediated (inflammatory) myopathies, muscular dystrophies, metabolic myopathies, and congenital myopathies. There are occasional examples of the pathology of other disorders that are in the differential diagnosis of some of these entities in order to illustrate their contrasting pathologic features. Two other articles are companions for this article. 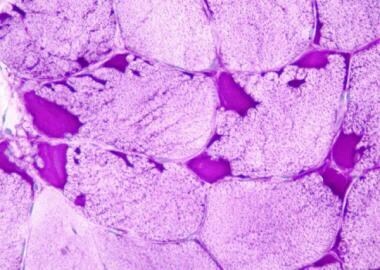 The article Skeletal Muscle - Structure and Histology provides a review of normal skeletal muscle histology and ultrastructure, including the histologic appearance of normal muscle with some of the various stains that are used for the processing of muscle biopsies. The article Muscle Biopsy and Clinical and Laboratory Features of Neuromuscular Disease provides information about the procedure of muscle biopsy and background about the general features of the clinical presentations of neuromuscular disorders. Interpretation of a muscle biopsy can be a challenging task. This process can be difficult because few individual histologic findings are specifically diagnostic of a single disorder. Most muscle biopsies exhibit a constellation of pathologic findings that must be synthesized to arrive at a diagnosis. 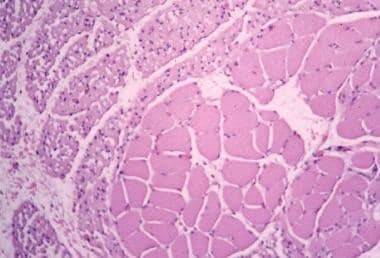 The muscle pathologist must analyze and interpret the histopathologic features within the individual clinical context to arrive at a diagnostic formulation that makes sense for a given patient. Here is an example to illustrate the lack of specificity of histopathologic findings and the importance of clinical information for interpretation of a muscle biopsy: A biopsy might exhibit myofibers that contain clear vacuoles on hematoxylin and eosin (H&E) sections. Similar vacuoles can be observed in a variety of settings, including glycogen storage disease, colchicine toxic myopathy, critical care myopathy, the periodic paralyses, and technical artifact, among others. The pathologist uses a variety of strategies to decide which is the most likely cause of the vacuoles in a given case and to determine whether additional special studies are indicated. The simplest and most cost-effective first step is to know which disorders might be reasonable considerations for a specific patient. Many biopsy samples show numerous pathological findings in varying degrees, each of which is consistent with an assortment of diagnoses. The pathologist must judge the clinical significance of each finding, decide if and how it fits with the other findings in the specimen, and determine what light to cast on the biopsy result to best fit the patient's presentation. This means that the physicians who submit the biopsy must provide reasonably detailed clinical information. Simply writing, "R/O polymyositis" or "weakness", or worse, "muscle weakness" (we would not be concerned about weakness of character here, so using the term muscle weakness in this context seems oddly redundant) does not provide the pathologist with any useful clinical information and is a disservice to the patient. The clinical information you provide is not just a bureaucratic requirement and it is not for the benefit of the pathologist; it is for the patient. Neurogenic atrophy. Nicotinamide adenine dinucleotide tetrazolium reductase (NADH) frozen section shows an isolated angulated atrophic myofiber that stains intensely with this stain. This is a characteristic image of a denervated fiber. Fiber-type grouping (see the image below): This finding occurs when denervation and reinnervation have taken place. The innervation of a myofiber determines its type. If a motor unit that was originally innervated by a type 1 nerve loses its innervation, a number of isolated angulated atrophic fibers are initially scattered about within a small region of the muscle. If a neighboring intact type 2 motor neuron sprouts and reinnervates these myofibers, all of the muscle fibers in the region become type 2. 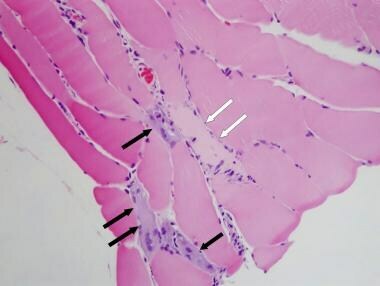 The reinnrvated muscle loses the normal random checkerboard distribution of myofiber types (see the section Skeletal Muscle Histology in the article Skeletal Muscle-Structure and Histology) and instead shows areas that contain groups of type 1 myofibers and other areas with groups of type 2 myofibers . Neurogenic process, fiber-type grouping myosin adenosine triphosphatase (ATPase) pH 10.5. When reinnervation occurs, myofiber types cluster instead of exhibiting the normal random checkerboard distribution of the two myofiber types. The left side of the sample shows a field composed exclusively of type 2 myofibers stained brown. 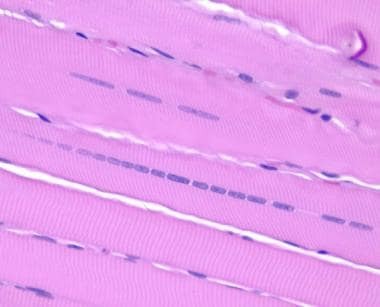 The right side shows a field of type 1 myofibers stained pink. This is a reinnervation pattern. If the pH is varied different myofiber types will stain with the myosin ATPase histochemical stain. 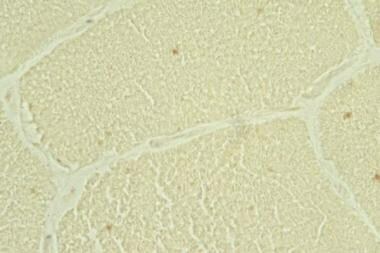 For example, at pH 4.3, the type 1 myofibers will stain brown. 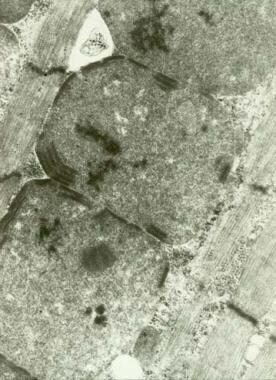 At pH 10.5, the type 2 myofibers will stain brown, as in this example. Some laboratories still perform the myosin ATPase fiber-typing stains, but many have replaced them with myosin heavy chain immunohistochemistry studies that can perform the same function of identifying different myofiber types. This myosin heavy chain immunohistochemistry study employs an antibody to the myosin heavy chain isotype that occurs in type 1 myofibers. The type 1 myofibers in this image are stained brown and the type 2 myofibers are pale blue. In normal muscle, there is a random interdigitation of myofiber types; here there are areas composed of groups of type 1 myofibers and other areas consist of groups of type 2 myofibers. This is known as fiber-type grouping; it is evidence that there has been reinnervation of previously denervated myofibers. Neurogenic atrophy, hematoxylin and eosin (H&E) cryostat section. Group atrophy, in this case consisting of a small group of angulated atrophic fibers is seen at the center of this field. The groups of atrophic myofibers can be larger and can even consist of entire fascicles. Target fibers, which comprise another characteristic feature of neurogenic disorders, are seen in the image, below. The targets are central zones of pallor, demarcated by a dark rim, sometimes with a third zone of intermediate intensity of staining. Neurogenic process, target fibers on nicotinamide adenine dinucleotide tetrazolium reductase (NADH) stain. Several target fibers are distributed throughout the image. These myofibers contain central round, clear areas with peripheral dark rims. A target sometimes has a third zone of intermediate intensity. Target fibers are observed in active denervation. Nuclear clumps, another finding that commonly occurs in neurogenic atrophy, are seen in the following image. Neurogenic process, nuclear clumps, hematoxylin and eosin (H&E) paraffin section. The arrow indicates a dark blue structure that is a cluster of nuclei referred to as a nuclear clump. Several other nuclear clumps are present in this image. They are typically a feature of neurogenic atrophy, although they can also be observed in myopathies. This image also shows a small group of angulated atrophic myofibers and an increase in internal nuclei. When all of these findings are present and no other abnormalities are found in the specimen, the diagnosis of neurogenic atrophy with evidence of denervation and reinnervation is straightforward. 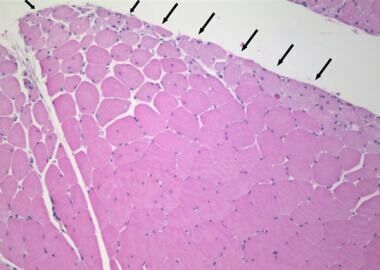 Often, the biopsy shows a combination of neurogenic and myopathic findings (see Muscle Biopsy in Myopathy, below). These additional myopathic features may represent myopathy that is secondary to the neuropathic process, which are referred to as pseudomyopathic features, or a separate unrelated primary myopathic process. The pathologist can often surmise the correct interpretation based on clinical findings and the balance of the pathologic features, but the truth cannot usually be determined with certainty based upon the histological features alone. Knowledge of the pertinent clinical and laboratory features can often eliminate the uncertainty and lead to a definitive biopsy diagnosis. Many biopsy samples with inflammation also demonstrate evidence of neurogenic change. A few possible mechanisms account for neurogenic change in the setting of an inflammatory disorder: (1) myogenic denervation, in which the sick muscle fibers lose their innervation; (2) innocent bystander mechanism, in which the inflammatory process overruns and entraps the intramuscular nerve twigs, resulting in denervation; and (3) separate concurrent inflammation of peripheral nerves. An unrelated neurogenic disorder is also possible. A broad spectrum of pathologic findings can occur in myopathic disorders. Each individual finding is usually nonspecific and can be found in a variety of pathologic processes. A single finding can have many connotations, and the pathologist must always use knowledge of the clinical context to interpret the diagnostic significance of the individual findings. The constellation of pathologic findings considered within a given clinical setting leads to the diagnosis. Myofiber necrosis, hematoxylin and eosin (H&E) paraffin section. Two necrotic myofibers are present in the center of this image. They are mildly swollen and their cytoplasm is paler than the surrounding viable myofibers and has a homogenized appearance without striations, which are faintly detectable in the intact fibers in the upper left quadrant of the image. Myophagocytosis, hematoxylin and eosin (H&E) cryostat section. A single necrotic myofiber, located approximately in the center of the field, has pale cytoplasm and numerous nuclei, some associated with foamy cytoplasm. These cells are macrophages that are removing cellular debris. Regeneration, hematoxylin and eosin (H&E) paraffin section. Two contiguous regenerating myofibers course through the center of this image. Regenerating fibers have basophilic, or blue, cytoplasm. 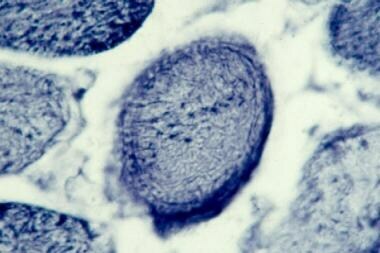 Nuclei are enlarged and contain conspicuous nucleoli. Myopathic rounded atrophic fibers on hematoxylin and eosin (H&E) cryostat section. This specimen from a patient with muscular dystrophy has greater-than-normal variability of myofiber size due to both myofiber hypertrophy and atrophy. In contrast to the angulated myofibers that typify neurogenic atrophy, these myopathic atrophic myofibers are rounded. Myofiber hypertrophy and splitting, hematoxylin and eosin (H&E) stain. Myofibers in this slightly tangential cross-section are enlarged, and a few exhibit splitting, in which individual myofibers are divided into 2 fibers with ingrowth of endomysium and blood vessels that divides what was previously a single myofiber into two myofibers. 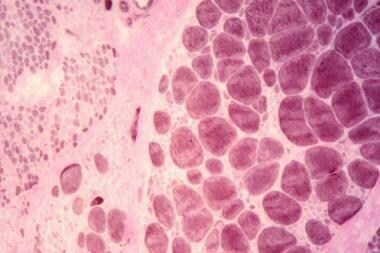 Increase in internal nuclei: Myofiber nuclei are normally located at the periphery of the cell; it is abnormal when greater than 3% of the myofibers in a specimen exhibit internal nuclei (see the following image). Internal nuclei on hematoxylin and eosin (H&E) paraffin section. Most of the myofibers here are large and contain several nuclei in the middle of the cytoplasmic compartment. 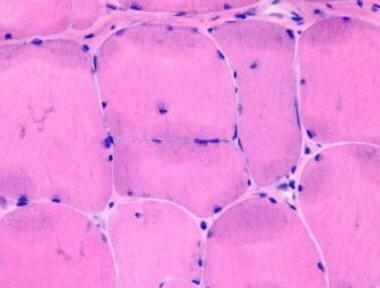 In normal skeletal muscle, as many as 3% of the myofibers can have internal nuclei, but in most normal myofibers the nuclei are located at the periphery of the cells. Endomysial fibrosis, hematoxylin and eosin (H&E) cryostat section. Sample from a 10-year-old child with probable congenital muscular dystrophy shows moderately severe endomysial fibrosis. 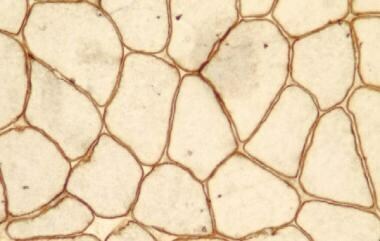 One clue to help identify fibrosis is the separation of myofibers. In normal muscle, the endomysium is so thin it is almost invisible, and the myofibers appear to be almost in direct contact with each other. This sample also shows increased variability of fiber size due to myofiber atrophy and there is an increase in internal nuclei. Nuclear chain on hematoxylin and eosin (H&E) paraffin section. One myofiber near the center contains a row of nuclei lined up, forming a chain. This is a nonspecific, relatively common finding in myopathy. Moth-eaten fibers on nicotinamide adenine dinucleotide tetrazolium reductase (NADH)–stained section. 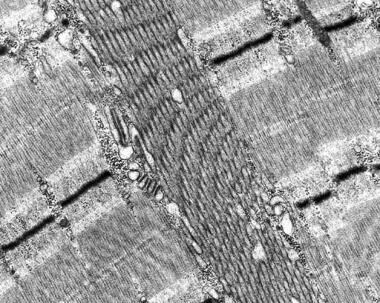 Many myofibers in this section have an irregular distribution of the intermyofibrillar network, with many irregular patchy pale areas, in a pattern reminiscent of that formed in a sweater besieged by moths. This is a nonspecific myopathic pattern and indicates that these fibers are not well. Nicotinamide adenine dinucleotide tetrazolium reductase (NADH) cryostat section showing a ring fiber in the center of the field. Myofibrils at the periphery of this ring fiber are oriented circumferentially instead of longitudinally. This finding occurs in myotonic dystrophy, but it is a nonspecific finding and can be seen in other myopathies. This specimen is not from a patient with myotonic dystrophy. Whorled fibers on nicotinamide adenine dinucleotide tetrazolium reductase (NADH) stain. Two whorled fibers observed in this cryostat section are characterized by a coiled appearance of the sarcoplasm. This finding is nonspecific. Clear sarcoplasmic (cytoplasmic) vacuoles, hematoxylin and eosin (H&E) paraffin section. Many of the myofibers in this section have multiple clear sarcoplasmic vacuoles. This biopsy is from a patient with colchicine myopathy. There are multiple potential causes of clear sarcoplasmic vacuoles, including technical artifact. 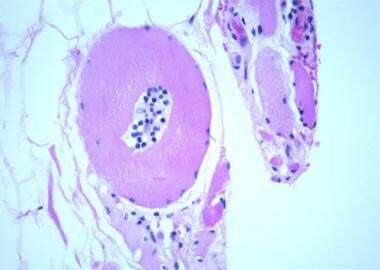 Inclusions in hematoxylin and eosin paraffin section. Many of the myofibers in this section have fairly large zones of included material consisting of homogeneous pale pink material. This image is from a patient with tubular aggregate myopathy. Inclusion in a case of oculopharyngeal dystrophy (French Canadian type), hematoxylin and eosin (H&E) cryostat section. A small myofiber has an ovoid eosinophilic inclusion with a faint blue rim, which is indicated by the black arrow. This inclusion is the same type that can be found in sporadic inclusion body myositis and hereditary inclusion body myopathies. This section also shows greater-than-normal variability of myofiber size due to the presence of both myofiber atrophy and hypertrophy, an increase in internal nuclei, and a single small fiber (dark red) that is probably degenerating. The dark green arrows indicate a split fiber, which occurs when there is myofiber hypertrophy. It was knowledge of the clinical features that led to the specific diagnosis in this case. Polymyositis, hematoxylin and eosin (H&E) cryostat section. The numerous small dark blue cells constitute a dense, chronic, endomysial lymphocytic inflammatory infiltrate. This section also shows many rounded atrophic myofibers, an increase in internal nuclei, and moderate endomysial fibrosis. Polymyositis on hematoxylin and eosin (H&E) cryostat section. Endomysial chronic inflammation is present among intact myofibers that are remarkable only for increased variability of fiber size. 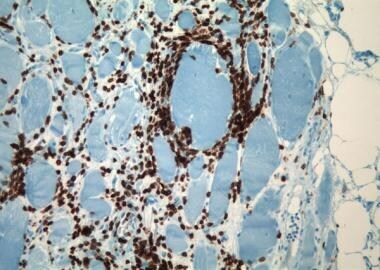 Polymyositis, immunohistochemistry for CD3 (T-lymphocytes) with hematoxylin counterstain. All of the brown cells percolating throughout the endomysium are T-lymphocytes. The myofibers in this field are not necrotic. The lower region of the largest myofiber in the field appears to be invaginated by lymphocytes, which is evidence of an attack on a non-necrotic myofiber by T-lymphocytes. There is also myofiber atrophy and mild-to-moderate endomysial fibrosis. 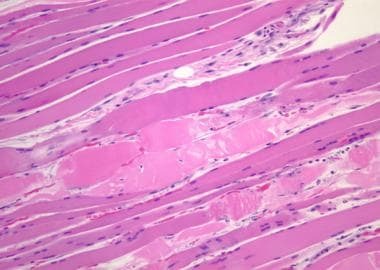 Some histologic findings mimic abnormalities but are actually normal features of skeletal muscle structure. 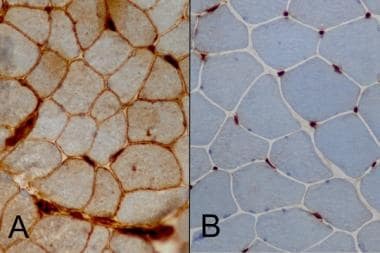 For example, near the myotendinous junction, the muscle fibers appear fragmented, exhibit increased variability of fiber size, and have an increase in number of internal nuclei (see the image below). 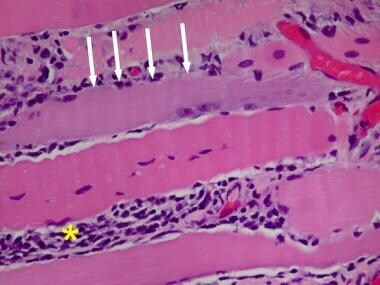 The myofibers near the myotendinous insertion in normal muscle can also contain nemaline rods (see "Nemaline myopathy" in the Congenital Myopathies and Tubular Aggregate Myopathy section). The pathologist must be vigilant not to misinterpret these normal findings. 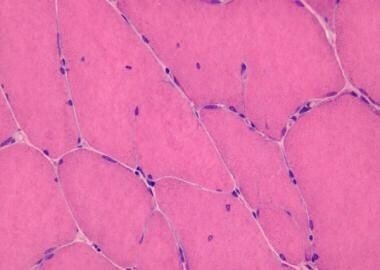 Myotendinous junction on hematoxylin and eosin (H&E) paraffin section. Segment of dense epimysial connective tissue traverses the field, forming a partial U shape. Myofibers in its vicinity vary in size and shape and have numerous internal nuclei. These findings are normal and expected at a myotendinous insertion and therefore should not be misinterpreted as being pathological. The clinical features and pathology of these myopathies are reviewed by diagnostic category in the following sections. The term myositis is nonspecific and refers to inflammatory disease of muscle, encompassing both infectious and noninfectious inflammatory disorders, and includes some immune-mediated disorders that exhibit little to no inflammation on muscle biopsy. Infectious myositis occurs from direct infection of skeletal muscle by organisms from any category, including bacteria, viruses, protozoans (eg, Toxoplasma gondii) and metazoans (eg, the nematode Trichinella spiralis or the cestode Taenia solium). 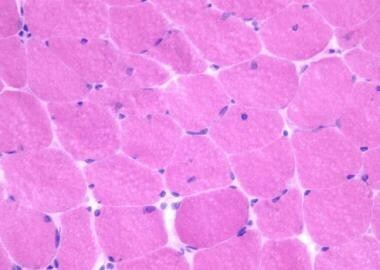 See the end of this section for an image of a muscle with trichinosis. A postinfectious inflammatory myopathy can occur, in which the organism might no longer be present or may never have been present in the muscle, and the inflammatory disorder in this case can be the result of an autoimmune response to the infection. 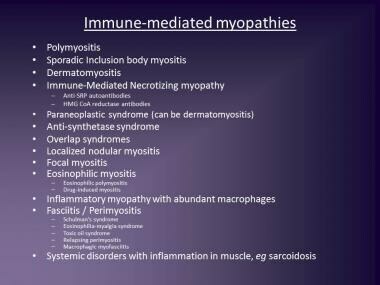 This is a list of many of the immune-mediated myopathies. The category, fasciitis / perimyositis, is included in the list. These disorders in this category predominantly affect connective tissue of skin, subcutaneous tissue and muscle rather than myofibers. There is often a degree of myofiber injury in this group of disorders and affected individuals can exhibit signs and symptoms of skeletal muscle disease, so fasciitis / perimyositis belongs on this list. The most common reason for performing a muscle biopsy is to address the diagnostic consideration of immune-mediated myopathy. The three major immune-mediated (or inflammatory myopathies) that have been recognized for the last few to several decades are polymyositis, dermatomyositis, and sporadic inclusion body myositis (to be referred to here as IBM). It is not certain whether IBM will always remain in this category or if it will be moved into the category of degenerative diseases of muscle (it will probably always straddle both categories); for now, it is considered in this section of this article. 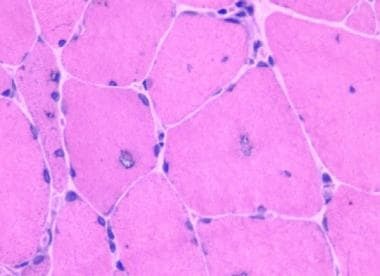 A fourth category of immune-mediated myopathy, that of immune-mediated necrotizing myopathy, is now recognized as a significant category among the autoimmune myopathies. The usual clinical presentation of individuals with polymyositis and dermatomyositis is a subacute course of progressive weakness affecting proximal muscle groups, occasionally with myalgia, an elevated creatine kinase (CK) level, and myopathic and irritative findings on electromyography (EMG). Many patients have serum autoantibodies, [3, 5] many of which are associated with specific clinical syndromes; the specific autoantibodies are taking on increasing importance in the classification of the inflammatory myopathies. Patients with dermatomyositis usually have characteristic cutaneous findings, such as a periocular heliotrope rash, Gottron papules on the extensor surfaces of the hands and fingers over the joints, or certain other skin changes. Dermatomyositis in adults can be a paraneoplastic syndrome  ; therefore, some testing for malignancy is necessary when an adult patient has this disorder. Dermatomyositis can develop before, concurrently with, or following the diagnosis of a neoplasm, usually within 2 years either before or after. The risk of malignancy in a specific individual with dermatomyositis is associated with which autoantibody is present; some autoantibodies are associated with a high risk of malignancy and others with a low risk. Polymyositis can also be a paraneoplastic syndrome, but the association of polymyositis with cancer is weaker than that of dermatomyositis. The clinical presentation of immune-mediated necrotizing myopathy (IMNM) varies depending upon the underlying cause. In one form of this disorder that can be associated with anti-signal recognition particle (anti-SRP) antibodies, individuals typically present with a rapidly progressive proximal myopathy. One form of IMNM is associated with treatment with the statin medications that are hydroxy-methyl-glutaryl coenzyme A reductase (HMGCR) inhibitors. Affected individuals present with a subacute progressive proximal myopathy. Progression continues despite discontinuation of the statin medication. Many of the individuals with statin-associated IMNM have HMGCR autoantibodies. There are also non-immune myopathies that are associated with treatment of statin medications; these are not discussed here. Endomysial inflammation (see the images below): The inflammatory infiltrates in polymyositis are predominantly endomysial, and they are enriched with T-lymphocytes, particularly T-suppressor/cytotoxic (CD8) lymphocytes. Polymyositis, H&E cryostat section: The white arrows in the image point to lymphocytic inflammation that streams through the endomysium among nonnecrotic myofibers. Invasion of (or an attack on) nonnecrotic myofibers by autoaggressive lymphocytes (see the following images): This is a key diagnostic finding in which T cells attack intact myofibers, and it is believed to be the pathologic correlate of the main factor in the etiopathogenesis of polymyositis. [7, 8, 9] This represents the fundamental distinction between inflammation that can occur as a secondary phenomenon and inflammation that is the primary pathologic process. In the former case (eg, muscular dystrophy), inflammation is usually found associated with fibers that are already degenerating. In polymyositis, inflammation can be found associated with healthy, intact fibers. Polymyositis. Panel A, hematoxylin and eosin (H&E) paraffin section shows an attack on a nonnecrotic myofiber by autoaggressive lymphocytes. Panel B, immunohistochemistry for CD3 (T-lymphocytes) demonstrates segmental infiltration of a non-necrotic myofiber by T-lymphocytes. Labeling for CD8 or cytotoxic/suppressor T-lymphocytes would be more specific. The expression of major histocompatibility complex (MHC) class I antigen or human leukocyte antigen (HLA) class ABC (or class I) antigen on the surface of intact (nonnecrotic or nonregenerating) myofibers occurs in all inflammatory myopathies and is not specific for polymyositis (see the image below). This up-regulation of HLA class I expression on nonnecrotic myofiber surfaces is not entirely specific for inflammatory myopathies and can be found in some muscular dystrophies. Degenerating and regenerating myofibers in any disorder often have HLA class I upregulation, so one must consider only the intact myofibers when interpreting this stain. 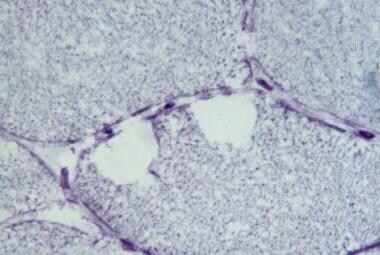 Polymyositis, HLA Class I immunohistochemistry. Panel A, on the left, demonstrates widespread expression of HLA Class I antigen on the surfaces of myofibers, indicated by the brown staining at the periphery of all of the myofibers in the section. Panel B, on the right, demonstrates the same preparation on a normal control muscle, in which there is no labeling of myofibers and only the capillaries in the muscle are stained brown. Polymyositis, myofiber necrosis, H&E frozen section. The large myofiber running obliquely across the center of the image is necrotic. Compared to the adjacent viable myofiber, located obliquely just above and to the right, the necrotic myofiber is somewhat swollen, the sarcoplasm (cytoplasm of a myofiber) is pale and its texture is coarse. Lymphocytes, small round blue structures, infiltrate the endomysial connective tissue, best seen in the lower left quadrant of the image. Myophagocytosis (see the following image): This is the removal of the dead cellular elements by macrophages. Polymyositis, myophagocytosis, H&E frozen section. The white arrows indicate a necrotic myofiber that is undergoing myophagocytosis, which means the cellular debris of the dead myofiber is being removed by macrophages. The white asterisk indicates lymphocytic endomysial infiltration, which can be seen throughout much of the image. Internal nuclei (see the image below): An increase in internal nuclei is a nonspecific myopathic finding. Polymyositis, increase in internal nuclei, H&E frozen section. The white arrow points to a small blue dot, which is a nucleus located in the center of a myofiber, which is referred to as an internal nucleus. In normal skeletal muscle, nuclei are located at the periphery of most myofibers. 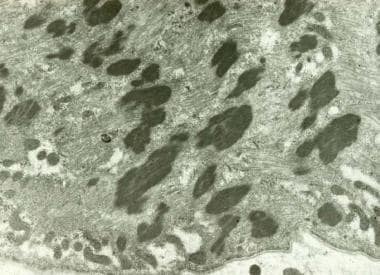 Approximately one-third of the myofibers in this image have internal nuclei, which is abnormal. This image also shows lymphocytic endomysial inflammation, seen as blue dots between myofibers, and a few necrotic myofibers undergoing myophagocytosis. Myofiber atrophy: Myopathic atrophic fibers are generally of both myofiber types and rounded in contour. 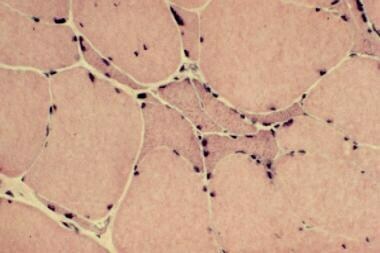 In some patients with polymyositis, the atrophy affects primarily type 2 myofibers. In patients with inflammatory myopathies, type 2 myofiber atrophy can also be the result of treatment with steroids. Polymyositis, regenerating fiber, H&E frozen section. The white arrows indicate a regenerating myofiber, which is recognized by its lightly basophilic (slightly blue) cytoplasm and its prominent nuclei with visible nucleoli. The yellow asterisk is located within an area of endomysial lymphocytic inflammation. Endomysial fibrosis: This is a feature of chronic polymyositis. 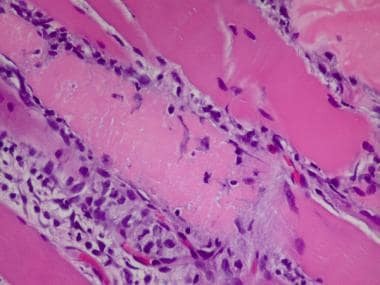 The distribution of the pathology in polymyositis can be patchy, so it is possible for a patient who has this disorder to have a normal muscle biopsy, and this does not completely exclude the diagnosis. Magnetic resonance imaging of the muscle reportedly assists in selection of a muscle to biopsy to increase the likelihood of a positive biopsy. As in all of medicine, neuromuscular diagnosis is a synthesis of clinical, laboratory, and biopsy features, and physicians must use judgment in interpreting the clinical significance of each individual result. Pathologic findings in dermatomyositis can sometimes bear a superficial resemblance to polymyositis, but some important distinguishing features are present. In many patients, the pathology of dermatomyositis is strikingly unique. Chronic inflammation (see the image below): The infiltrates are most often concentrated in a perimysial perivascular distribution. More B-lymphocytes and T-helper (CD4) lymphocytes are present than in polymyositis. If the histologic features are otherwise characteristic, the diagnosis is made regardless of the exact cell types within an individual infiltrate in a single case, so if typing the lymphocytes is not expected to contribute to the diagnosis, it is not performed. Some cases of dermatomyositis do not exhibit inflammation. Dermatomyositis, hematoxylin and eosin (H&E) paraffin section. In dermatomyositis, the characteristic inflammation is perivascular within the perimysial connective tissue. 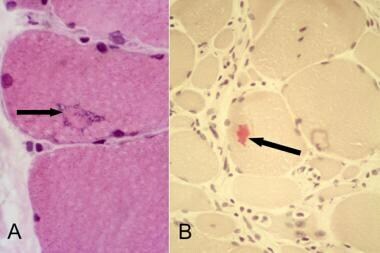 In this image, a perivascular lymphocytic infiltrate is associated with a blood vessel, indicated by the arrow. A few red blood cells within the lumen assist in identifying the structure as a blood vessel. Notice that the surrounding myofibers and endomysium are not inflamed. 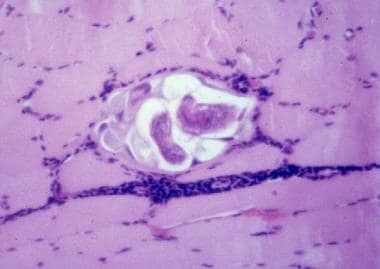 Perifascicular atrophy (see the following image): This type of myofiber atrophy affects the fibers at the periphery of the fascicle and is believed to be a product of muscle ischemia at the capillary level. It is found somewhat more often in juvenile dermatomyositis, but is frequently also observed in the adult variant of this disorder. Although perifascicular atrophy is not absolutely specific for dermatomyositis, it is found only in a small number of other disease processes. Dermatomyositis, hematoxylin and eosin (H&E) paraffin section. The large fascicle in this image shows myofiber atrophy that is located predominantly along one side of the periphery, indicated by the arrows. This is perifascicular atrophy, a finding that is highly characteristic of dermatomyositis, although this can be seen in other disorders. The cause of perifascicular atrophy is thought to be ischemia at the capillary level. This characteristic finding of dermatomyositis is most often associated with the juvenile form but it is also frequently observed in adult dermatomyositis. Myofiber necrosis and/or regeneration: This can occur in a perifascicular distribution. Complement deposition in microvessel walls (see the image below): The deposition of the membrane attack complex of complement (C5b-9) is found in the walls of the microvessels early in the disease process, even before other pathologic findings are present. This immune attack on vessel walls, with an immunologic cascade involving humoral immunity, may be the pathogenetic mechanism of dermatomyositis, according to the pioneering research of Andrew Engel and his colleagues. Treatment with steroids may promptly eliminate this finding. Immunohistochemistry for the membrane attack complex of complement (MAC) in dermatomyositis: a capillary that contains MAC in its wall is identified by the brown staining that has the ring-like shape of a capillary in cross-section. Tubuloreticular inclusions (TRIs) in endothelial cells (see the following image): This finding is seen only at the ultrastructural level and is usually no longer present after treatment. Dermatomyositis, tuboreticular inclusion in endothelial cell, on electron microscopy. 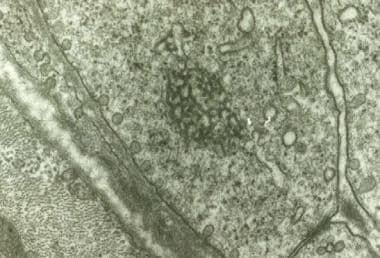 Endothelial cell, identified by the presence of many pinocytotic vesicles, contains an inclusion composed of an aggregate of anastomosing tubules. Dermatomyositis: HLA class I immunohistochemistry preparation demonstrates the labeling of most of the myofiber surfaces, indicated by the brown staining, as well as sarcoplasmic staining, in this image. Perifascicular atrophy is also visible. To compare this with the appearance of this stain in normal muscle, refer to panel B in the image of HLA class I immunohistochemistry in the polymyositis section, above. Inclusion body myositis (IBM) is the most common idiopathic inflammatory myopathy in patients older than 50 years. In contrast to polymyositis and dermatomyositis, which affect more women than men, IBM more often affects men, with a male-to-female ratio of 1.5:1. The clinical course of IBM is typically more indolent than polymyositis or dermatomyositis. It is not unusual for a person to have severe muscle atrophy at the time of presentation for medical care. This indicates that the disorder has been present for some time before the individual seeks medical evaluation. Distal muscle involvement, particularly with weakness of finger flexors, is a common feature of IBM, but it is unusual in other inflammatory myopathies. IBM is often resistant to therapy, although some patients do respond to immunomodulatory therapies. Chronic inflammation: The inflammatory process is similar to that of polymyositis, with an endomysial location of the inflammation and infiltrates that are enriched in CD8 lymphocytes, which are cytotoxic/suppressor T-lymphocytes. Inclusion body myositis, attack on nonnecrotic myofiber by autoaggressive lymphocytes, hematoxylin and eosin (H&E) paraffin section. The myofiber in the center of the field is not necrotic. This fiber is infiltrated by lymphocytes. This is a segmental attack on a non-necrotic myofiber by autoaggressive lymphocytes. 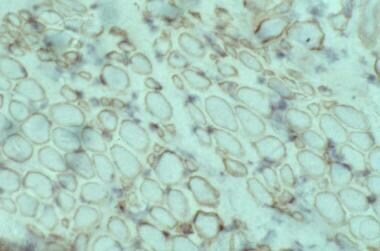 Immunohistochemistry would identify the lymphocytes as T-cells, most likely CD8 or cytoxic-suppressor T-lymphocytes. Inclusion body myositis (IBM), myofiber hypertrophy, and other myopathic features, on hematoxylin and eosin (H&E) frozen section. Several myofibers are large, and several are split. Split fibers can be identified as groups of 2 or more fibers that fit together in a single nest and share an imaginary outline, as opposed to the normal situation where fibers fit together in a mosaic pattern. Myofiber atrophy is also characteristic of IBM. Here, a component of the atrophy shares characteristics with neurogenic atrophy in that the atrophic fibers are angulated and occur in groups. Other atrophic myofibers are rounded or polygonal in shape. A few necrotic fibers undergoing myophagocytosis are found. Increase in internal nuclei and mild endomysial fibrosis are present. Atrophy: Some of the atrophic fibers in IBM share features with those of neurogenic atrophy. 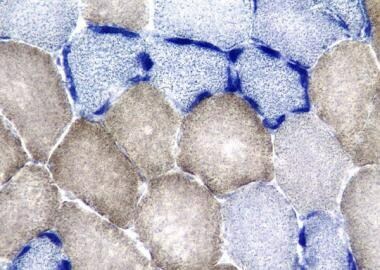 Rimmed vacuoles (see the following image): These appear on hematoxylin and eosin (H&E) sections as ovoid sarcoplasmic vacuoles lined by blue granular material. 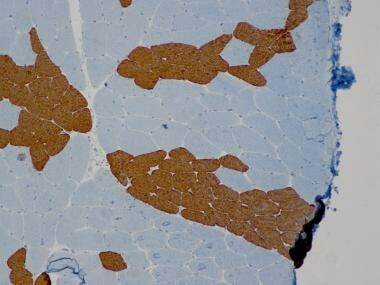 The granular material is red with the trichrome stain. Inclusion body myositis (IBM), rimmed vacuoles, on hematoxylin and eosin (H&E) cryostat sections. The arrows indicate 3 rimmed vacuoles, which are cytoplasmic vacuoles lined by basophilic granular material. The right and left panels are from two different cases of IBM. Eosinophilic inclusions (see the following images): These inclusions are dense and red (eosinophilic) on H&E sections, they can be cytoplasmic or nuclear, and they may be found within rimmed vacuoles. These inclusions can stain positive with a Congo red stain for amyloid and with stains for amyloid precursor protein, ubiquitin, and TDP-43, which are proteins typically associated with neurodegenerative disease. Inclusion body myositis, eosinophilic inclusion, on hematoxylin and eosin (H&E) cryostat section. Two large myofibers in the central region of the image contain dense eosinophilic inclusions surrounded by basophilic granular material. These inclusions may be cytoplasmic, within rimmed vacuoles, or they may be present within nuclei. These inclusions label for amyloid precursor protein, ubiquitin, tau, prion protein, and TDP-43, which are characteristic of central neurodegenerative diseases. Tubulofilamentous inclusions (see the image below): These are the ultrastructural counterparts of the eosinophilic inclusions observed by light microscopy. Inclusion body myositis, ultrastructure of tubulofilamentous inclusion. Characteristic tubulofilaments of the inclusions of inclusion-body myositis are seen in both cross section and longitudinal section in the cytoplasm of a myofiber in the center and lower left quadrant of this electron micrograph. They are 15-18 nm in diameter. 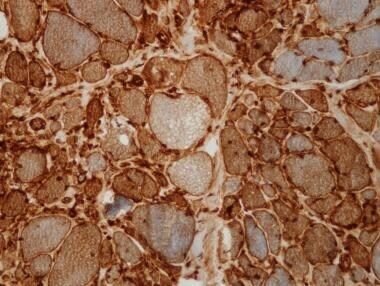 Inclusion body myositis: HLA class I immunohistochemistry demonstrates labeling of the surfaces and sarcoplasmic staining affecting all of the myofibers in this image, indicated by the brown staining. Myofiber atrophy and endomysial fibrosis are also visible in this area of the biopsy. Refer to Panel B in the image of HLA class I immunohistochemistry in the polymyositis section, above, to see the appearance of this stain in normal muscle. Myofiber degeneration, myophagocytosis, internal nuclei, endomysial fibrosis (see the following 2 images). Patients with IBM commonly seek medical care at a relatively late stage in the disease process, so the biopsies often demonstrate severe loss of muscle mass with prominent fibrosis and even adipose replacement of the muscle. Inclusion body myositis, chronic features, H&E paraffin section. Two histologic features that provide evidence that this disorder has been ongoing for quite some time are the replacement of the muscle by fibroadipose tissue and the endomysial fibrosis. The adipose (fatty) tissue is clear; it replaces the lost muscle mass. 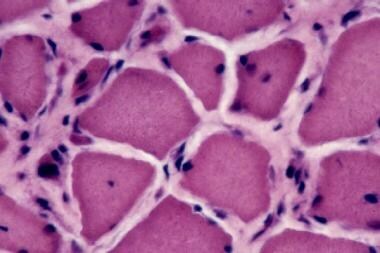 The endomysial fibrosis is the light pink tissue that separates the myofibers. Moderately severe myofiber atrophy leads to increased variability of myofiber size. Two black arrows indicate endomysial inflammatory infiltrates and a yellow asterisk identifies a myofiber under attack by lymphocytes. Ragged red fibers (see the image below), indicative of mitochondrial alterations are commonly found in IBM. Mitochondrial myopathy, Gomori trichrome frozen section. Observe the classic ragged red fiber in the center of the field. The peripheral rim of red staining represents abnormal aggregates of mitochondria. These ragged red fibers, indicative of mitochondrial alterations, are also often found in inclusion body myositis. They can be found as an age-related change in individuals older than 50 year, in which they should comprise no more than 1% of myofibers. 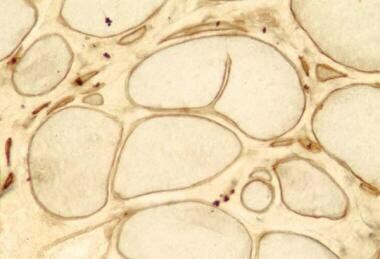 There are some muscle biopsies that show randomly distributed necrotic and/or regenerating myofibers and widespread myofiber labeling with the HLA class I immunohistochemistry preparation, but little to no inflammation. 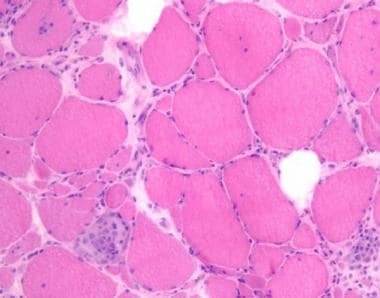 These biopsy findings are consistent with the diagnostic entity of immune-mediated necrotizing myopathy (IMNM). Some patients with IMNM present with a fairly rapidly evolving myopathy with severe weakness. They tend to have exceedingly high CK levels, often greater than 20,000 IU/L (normal CK levels are usually less than 200 IU/L). Some of these patients have autoantibodies in their serologic studies, often to anti–signal recognition particle (anti-SRP). The presence of these autoantibodies is the strongest evidence that this disorder is an immune-mediated disease. Anti-SRP IMNM is relatively resistant to therapy. Some patients with IMNM have a history of therapy for hypercholesterolemia with HMG-CoA reductase inhibitors and are found to have HMG-CoA reductase antibodies in their serum. 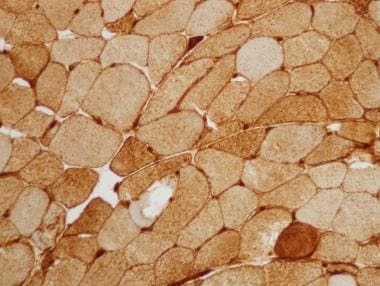 [13, 14, 15] IMNM is not the only type of myopathy that can develop in patients treated with statin medications; a discussion of this area is beyond the scope of this article. The next three images are from a case of IMNM. Immune-mediated necrotizing myopathy (IMNM), paraffin H&E section: The white arrows point to a pale necrotic myofiber undergoing myophagocytosis in a case of IMNM. Notice the lack of inflammation in the rest of the sample. IMNM, paraffin H&E section: This image, from the same case as the one just above, shows a necrotic myofiber, identified by its pale cytoplasm and indicated by the white arrows. The black arrows point to a few regenerating myofibers that are recognized by their basophilic cytoplasm and prominent nuclei with nucleoli. There is no inflammation. HLA Class I immunohistochemistry in IMNM: There is extensive labeling of myofiber surfaces and staining of sarcoplasm in this study. Please refer to panel B in the polymyositis section, above, to compare this with a negative study. An occasional eosinophil can often be seen in necrotizing and inflammatory myopathies. 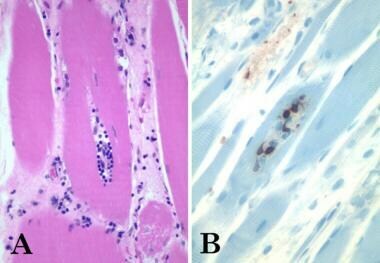 When many eosinophils are present, begin to search for a specific etiology of the myopathy, such as trichinosis (see the first image below) or drug reaction (see the second image below). Trichinosis, hematoxylin and eosin paraffin section. Larva of Trichinella spiralis occupies the center of the image. Below it, a chronic perivascular infiltrate courses horizontally across the field. Drug reaction on hematoxylin and eosin (H&E) section. Numerous eosinophils, identified by their bright red granular cytoplasm, are located in the connective tissue between myofibers; bright red extracellular granules are the result of release of granules by eosinophils. Clinicopathologic correlation confirms the histological findings to be most consistent with a drug reaction in this case. A muscular dystrophy is a potentially hereditary disease characterized by progressive degeneration of muscle. Many such diseases exist. The old nomenclature was somewhat random and comprised Duchenne, Becker, and various other eponymous dystrophies and dystrophies named for the distribution of affected muscle groups (such as oculopharyngeal muscular dystrophy or scapuloperoneal muscular dystrophy), all subclassified by their modes of inheritance. 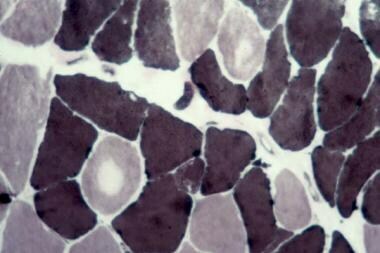 Some congenital muscular dystrophies are caused by mutations in genes that are responsible for glycosylation of alpha-dystroglycan, a membrane protein. These latter disorders belong to yet another category of disorders that has been recognized, that of muscular dystrophies that result from abnormalities of genes for proteins involved in the posttranslational modification of membrane proteins, rather than from defects that alter the primary amino acid sequence of membrane or cytoskeletal proteins. As steady progress is made in determining the genetic basis of many muscular dystrophies, in many cases muscle biopsy sometimes replaced by genetic testing and is becoming less important as a diagnostic tool for these disorders. 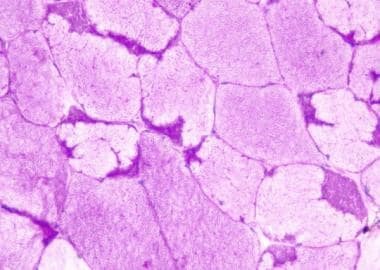 However, muscle biopsy is still required for many muscular dystrophies, in which the biopsy can identify a myopathic disorder as dystrophic rather than another category of myopathy. 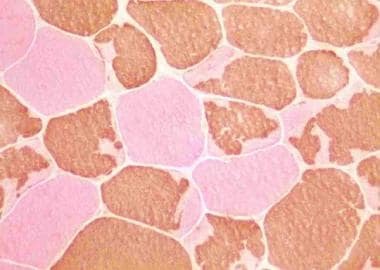 Immunohistochemistry for specific muscular dystrophy proteins can often narrow the diagnostic possibilities and limit the number of genetic tests needed in an individual case. Specific and directed biochemical or genetic testing can then be performed for definitive diagnosis. For patients with classic presentations of dystrophinopathies with characteristic clinical features of either Duchenne or Becker muscular dystrophy, the diagnosis can be made by genetic testing of blood samples, so muscle biopsy is not usually necessary in these cases. 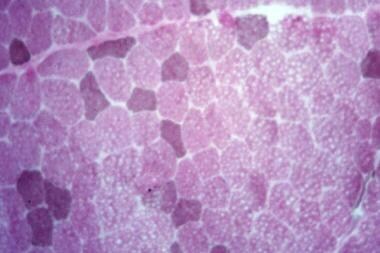 In certain cases of other types of muscular dystrophies with characteristic clinical presentations, genetic testing can also bypass the need for muscle biopsy for definitive diagnosis. For patients with nonclassic presentations and no family history of a dystrophinopathy, such as a limb-girdle dystrophy presenting in adulthood that is ultimately diagnosed as a dystrophinopathy or a woman who presents with a myopathic clinical syndrome and is eventually found to be a manifesting carrier of a dystrophin gene mutation, muscle biopsy is often a necessary first step to arrive at a diagnosis. 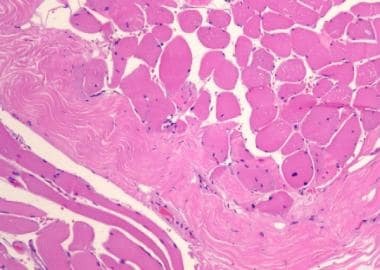 For patients with nonspecific clinical features of myopathy that, in some cases, will finally be diagnosed as a specific dystrophy, muscle biopsy is still an important diagnostic tool. 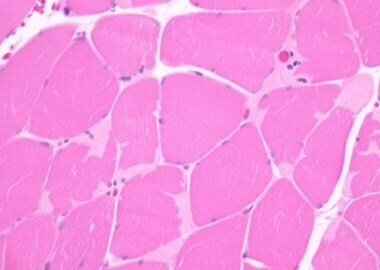 Most of the pathologic findings in the routine histologic sections of skeletal muscle in the muscular dystrophies are nonspecific myopathic findings (see the following series of images). Occasional features are somewhat characteristic of certain dystrophies, such as hypercontracted fibers in Duchenne muscular dystrophy (see the section about Duchenne muscular dystrophy, below, or the separate article Dystrophinopathies) or nuclear clumps in the muscle biopsies from some patients with limb-girdle muscular dystrophy (see Limb-Girdle Muscular Dystrophy). 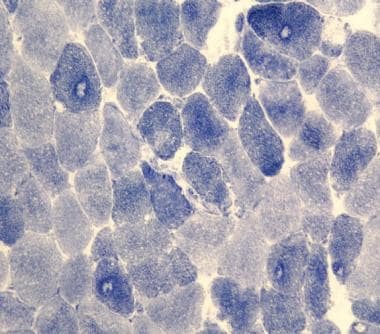 The skeletal muscles of certain patients with oculopharyngeal dystrophy (see the image below) contain rimmed vacuoles and eosinophilic inclusions similar to inclusion body myositis (IBM). 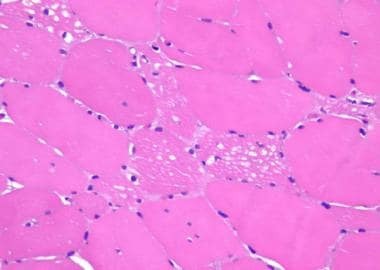 The specific diagnosis of muscular dystrophies can be confirmed in many cases by special immunohistochemical stains for specific proteins that are abnormal or deficient in these disorders. Many of these disorders are uncommon, so this testing is only available in a limited number of specialized centers, and it is necessary to send the muscle biopsy to a laboratory that is prepared to perform these studies, if they are indicated. 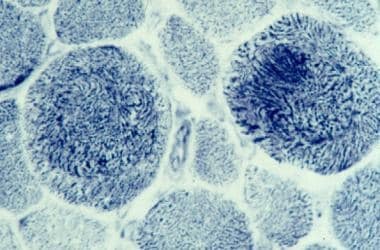 If the immunohistochemistry findings point to a certain disorder, the muscle specimen might be sent to a facility that can perform biochemical analysis for the protein or direct genetic testing. More often, in these cases, a sample of blood from the affected individual can be submitted to a laboratory that performs genetic testing for confirmation of the immunohistochemistry results and final definitive diagnosis. 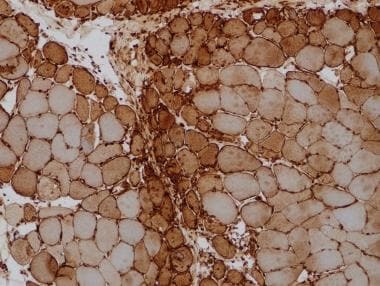 Some muscular dystrophies cannot be specifically diagnosed by immunohistochemistry, for reasons that are beyond the scope of this article. Examples of muscle biopsies from patients with the two dystrophinopathies, Duchenne and Becker muscular dystrophies, and congenital muscular dystrophy (CMD) due to laminin alpha-2 deficiency are presented below to illustrate the pathology of muscular dystrophies. Duchenne muscular dystrophy (DMD) is the most common and most severe of all muscular dystrophies, occurring with a frequency of 1 case in 3500 - 5,000 live male births. This condition is caused by a mutation on the X-chromosome in the gene for the protein dystrophin, resulting in an absence of the protein. Dystrophin is a structural protein that is normally located on the inner aspect of the sarcolemma (muscle plasma membrane). The gene for dystrophin is large, with approximately 2 million base pairs. Because of the size of this gene, spontaneous mutations are common, and one-third of patients with DMD do not have a family history of the disease. Dystrophinopathy, Duchenne muscular dystrophy, myopathic features, on hematoxylin and eosin (H&E) cryostat section. This image shows marked endomysial and perimysial fibrosis and increased variability of myofiber size due to the presence of atrophy and hypertrophy of myofibers. Dystrophinopathy, Duchenne muscular dystrophy, on hematoxylin and eosin (H&E) cryostat section. The two myofibers that occupy the majority of this image originate from a single hypertrophied myofiber that split by the ingrowth of connective tissue. A fiber-typing stain would demonstrate that these two fibers are of the same myofiber type (not shown). 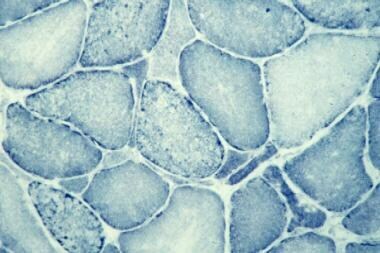 Dystrophinopathy, Duchenne muscular dystrophy, hematoxylin and eosin (H&E) frozen section. A necrotic myofiber, with pale cytoplasm, is undergoing myophagocytosis. This image also shows an increase in internal nuclei, increased variability of myofiber size, two opaque fibers located just below the necrotic fiber, and prominent endomysial fibrosis. Opaque fibers (see the following image): These are characteristic of DMD, although they can be found in other disorders and can be a technical effect. Opaque fibers are enlarged, densely eosinophilic fibers that are hypercontracted. Their presence in DMD caused investigators to postulate that membrane defects might be present in DMD, which were later demonstrated, and this finding eventually led to the discovery of the cause of DMD. 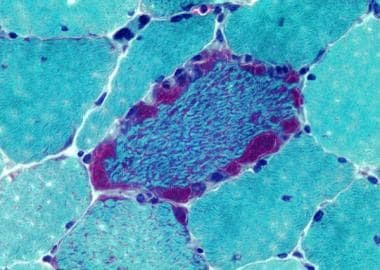 [21, 22] In DMD, the lack of dystrophin leads to membrane instability, which is responsible for the cascade of cellular events that causes cycles of necrosis, regeneration, and progressive fibrosis of the muscle. Dystrophinopathy, Duchenne muscular dystrophy, opaque fibers, hematoxylin and eosin (H&E) paraffin section. Occasional myofibers scattered throughout this biopsy sample are large, dark red, and glassy. Termed opaque fibers, they represent hypercontracted fibers. The image also shows increased variability of myofiber size, focal myofiber necrosis, mild increase in internal nuclei, and extensive fibrosis of both perimysium and endomysium. 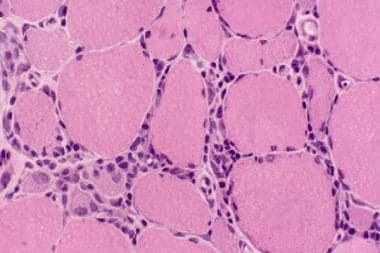 The specific diagnosis of DMD on muscle biopsy relies on special immunohistochemical studies, most often for the N -terminal, mid-rod, and C -terminal regions of dystrophin. Some laboratories use other sets of anti-dystrophin antibodies. In control skeletal muscle, these studies reveal linear labeling of the periphery of the myofibers, consistent with the regular periodic subsarcolemmal localization of dystrophin (see the first image below). In a patient with DMD (see the second image below), all 3 antibodies demonstrate absence of labeling of all but an occasional myofiber. 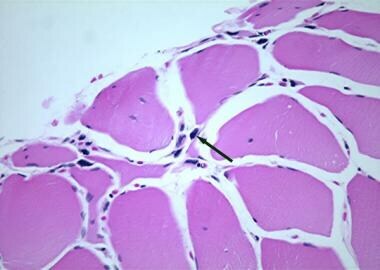 Normal muscle, dystrophin immunohistochemistry, on cryostat section. 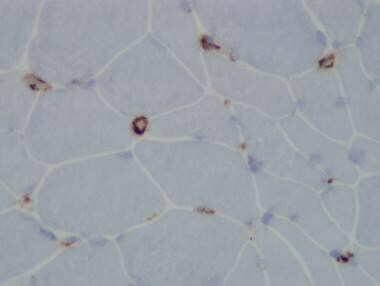 Sample of normal muscle stained with an antibody to dystrophin shows the normal subsarcolemmal localization of this protein demonstrated by the linear peripheral brown staining of every myofiber. Dystrophinopathy, Duchenne muscular dystrophy, dystrophin immunohistochemistry. 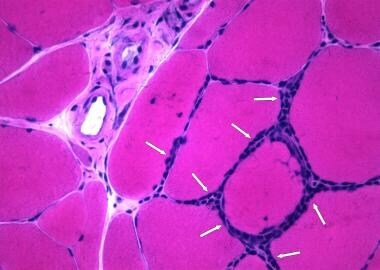 Most of the myofibers of this muscle fail to label with antibodies to the dystrophin molecule. A single fiber does label for dystrophin. This is a revertant fiber, one in which a second mutation in the large dystrophin gene has restored the ability of this myofiber to produce dystrophin. The identical result is obtained with antibodies specific for the N-terminal, C-terminal, and mid-rod portions of the dystrophin molecule. The previous image shows the pattern of staining expected when dystrophin is present, for comparison. The rare myofibers that do label with antidystrophin antibody can produce dystrophin because of a second mutation in the dystrophin gene that restores the reading frame and allows for production of this protein. The observation that occasional myofibers in patients with DMD can produce dystrophin serves as the basis for some efforts to develop novel therapeutic interventions for this disorder (see the previous image, which shows labeling for dystrophin in a single myofiber, whereas all of the other myofibers do not produce dystrophin). It is also possible to perform immunohistochemistry for a protein that is homologous to dystrophin, utrophin, which in postnatal life is normally limited to the neuromuscular junction. In patients with dystrophinopathies, utrophin expression is increased, and it can be detected in the sarcolemma by immunohistochemistry (see the image below). Upregulation of utrophin expression in a dystrophinopathy; immunohistochemistry for utrophin. Panel A, on the left, demonstrates the normal pattern of staining for utrophin in children and adults. The myofibers exhibit no detectable staining, while the blood vessels stain brown. Panel B, on the right, demonstrates upregulation of utrophin expression in a case of a dystrophinopathy. The myofibers exhibit extensive brown staining of the sarcolemmas (plasma membranes), indicative of the presence of utrophin, which may be an attempt to compensate for the lack of dystrophin in these myofibers. The clear vacuoles within the cytoplasm of the myofibers represent mild to moderate ice crystal artifact. 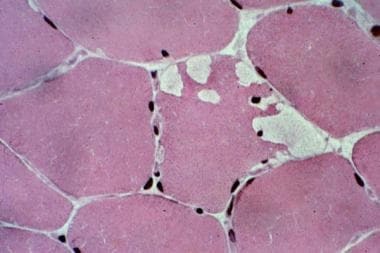 Becker muscular dystrophy (BMD), a disease similar to DMD but with a later onset and a course characterized by a slower progression, is also caused by mutations of the dystrophin gene. In BMD, the mutations lead to production of abnormal dystrophin, occasionally in decreased quantities in comparison with normal skeletal muscle and in contrast to the absence of dystrophin in DMD. 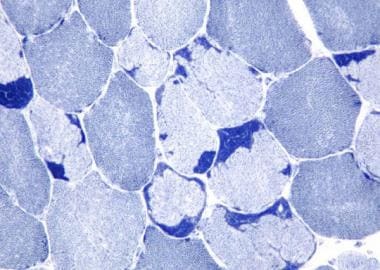 The term Becker muscular dystrophy should ultimately be replaced by the term dystrophinopathy with a designation of what part of the dystrophin molecule is affected in a given case. The course of BMD, as the term is commonly used in clinical practice, is more variable than that of DMD, which is stereotypical. Although BMD originally meant a progressive proximal myopathy presenting in young school-age boys, currently clinicians will use the term for an individual of any age who presents with a muscular dystrophy and is found to have abnormal dystrophin. In BMD, the severity of the disease generally correlates with the portion of the dystrophin molecule affected. The C -terminal end of dystrophin is linked to β-dystroglycan of the transmembrane glycoprotein complex that is linked to alpha-dystroglycan, which is, in turn, anchored to the external basal lamina of the myofiber. If the C -terminal region of the dystrophin molecule is absent, the patient experiences a severe course. In general, if the patient has a mutation affecting the mid-rod domain the course is less severe and more indolent. In the setting of a mutation affecting the N -terminal end of the dystrophin molecule, which is linked to cytoskeletal actin, the clinical course is often intermediate between the other two types. Myofiber necrosis (see the following images): Mild, focal, chronic inflammation is associated with some necrotic fibers in this biopsy. The presence of inflammation might lead to a mistaken consideration of an inflammatory myopathy. 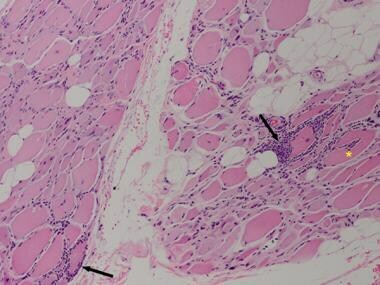 In this patient, the clinical history strongly suggests dystrophy instead of inflammatory myopathy, which should prompt a pathologist to avoid hastily forming an erroneous conclusion. 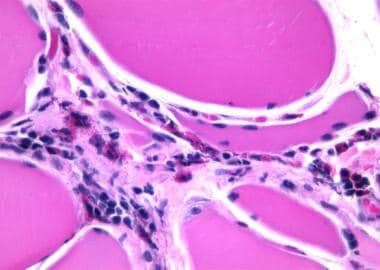 With dystrophy, the inflammation is often restricted to an association with necrotic fibers, whereas in myositis, it can usually be found elsewhere in the muscle; this key finding can sometimes help to distinguish the inflammation in a dystrophy from that of myositis. This assessment can be difficult, and exceptions to this guideline exist. In inflammatory myopathies, there should be widespread myofiber surface expression of human leukocyte antigen (HLA) class I antigen (see section about inflammatory myopathies, above), which in most dystrophies is limited to the actively necrotic or regenerating myofibers, so this study can also assist in distinguishing a dystrophy with inflammation from an inflammatory myopathy. 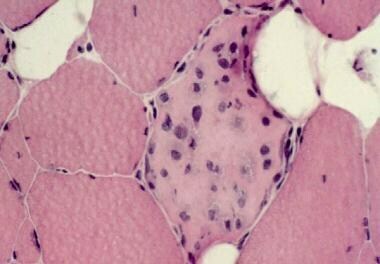 Dystrophinopathy, Becker muscular dystrophy, hematoxylin and eosin (H&E) paraffin section. A necrotic myofiber undergoing myophagocytosis occupies the central zone of this image. Focal, mild, chronic inflammatory response is observed surrounding the fiber. Striations are visible in the adjacent intact myofibers. Dystrophinopathy, Becker muscular dystrophy, hematoxylin and eosin (H&E) cryostat section. 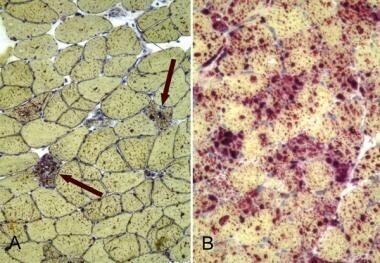 This muscle biopsy demonstrates greater-than-normal variability of myofiber size due to atrophy and hypertrophy. Most of the atrophic fibers have rounded contours. A mild increase in internal nuclei is also present. Dystrophinopathy, Becker muscular dystrophy, hematoxylin and eosin (H&E) cryostat section. A split fiber is observed in the center of the image. Internal nuclei are increased in number. Increase in internal nuclei (see the previous two images): In this patient, the increase in the percentage of myofibers with internal nuclei is mild. The findings in this representative biopsy, above, are nonspecific and can be observed in most muscular dystrophies. The immunohistochemical findings lend specificity to the histologic diagnosis. 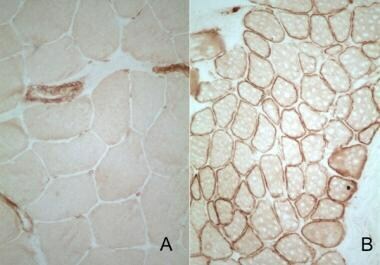 In this case, staining for C -terminal and mid-rod portions of the dystrophin molecule is normal (see the first image below), but the muscle shows no staining with the antibody for the N -terminal region (see the second image below). This is highly consistent with the diagnosis of BMD, but this diagnosis should be confirmed by sending a sample of blood for genetic testing for a mutation in the gene for dystrophin. 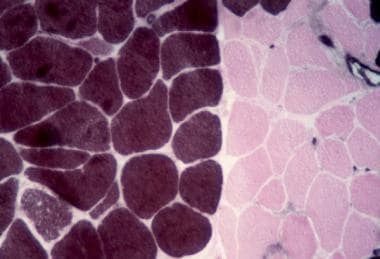 It might be possible to send a skeletal muscle specimen to a laboratory for Western blot analysis to confirm the immunohistochemistry result, but genetic testing on a sample of blood is currently more commonly performed and more widely available than analysis of the protein in muscle. Dystrophinopathy, Becker muscular dystrophy, dystrophin immunohistochemistry. This section, stained with an antibody to the C-terminal region of dystrophin, demonstrates a normal pattern of labeling of all of the myofibers, including the split fiber above the center of the picture. The labeling is indicated by the brown staining of the myofiber surface membranes. Dystrophin is located just internal to the sarcolemma, but subsarcolemmal staining cannot be distinguished from membranous labeling in this preparation. The terms sarcolemma and surface membrane are used interchangeably when referring to myofibers. Dystrophinopathy, Becker muscular dystrophy, dystrophin immunohistochemistry. This section, stained with an antibody to the N-terminal region of dystrophin, demonstrates absence of sarcolemmal staining, indicating that this portion of the dystrophin molecule is absent. Compare with the previous image, from the same patient, which demonstrates the presence of the C-terminal portion of dystrophin. The diffuse light brown color of the myofibers is a high background and has no diagnostic significance. Congenital muscular dystrophy is in the differential diagnosis of the floppy infant syndrome. An illustrative case is described below. Muscle biopsy was performed in a 4-month-old floppy male infant who was a full-term infant with low Apgar scores. He had mild joint contractures and weakness of the upper extremities greater than that of his lower extremities. Electrodiagnostic studies showed early myopathic units and borderline nerve conduction velocities. Computed tomography (CT) scans and magnetic resonance images (MRIs) of the brain were reportedly normal. This infant's muscle biopsy (see the following images) shows a range of fiber sizes, instead of the normal fairly uniform size of myofibers. 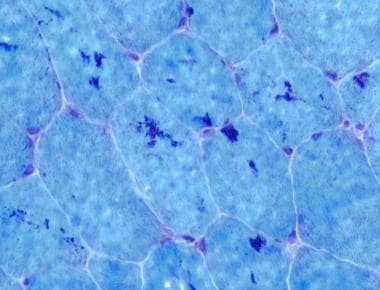 Congenital muscular dystrophy due to laminin α-2 (merosin) deficiency, dystrophin immunohistochemistry. This preparation demonstrates normal labeling with antibody to dystrophin, seen as brown sarcolemmal staining, which is present with all 3 antidystrophin antibodies. This muscle sample is not normal. Moderate variability of fiber size and fibrosis, which separates the myofibers, are present. Congenital muscular dystrophy due to deficiency of laminin alpha-2 (also known as merosin), laminin alpha-2 immunohistochemistry. The myofibers show no labeling with an antibody to laminin alpha-2 (merosin), a protein normally found within the basal lamina at the external surface of myofibers. The following image shows a normal control. 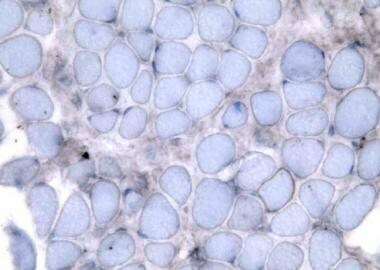 Normal muscle, laminin alpha-2 (merosin) immunohistochemistry. A normal pattern of labeling with the antibody to laminin alpha-2 (merosin) is demonstrated as a red reaction product at the sarcolemma (plasma membrane of the myofibers). Necrosis is absent, but occasional fibers exhibit minor nonspecific abnormalities on trichrome and nicotinamide adenine dinucleotide (NADH) stains. Immunohistochemical studies for dystrophin are normal (see the first image from this case, above), but no labeling occurs with an antibody to laminin alpha-2 (see the second image from this case, above). A control stain performed simultaneously on a normal muscle sample (see the third image from this case, above) demonstrates the normal pattern of staining for laminin alpha-2, demonstrating that the lack of staining observed in the case is specific for this case and not simply a technical failure of the staining procedure. The labeling that is present with antibodies to dystrophin, noted above, demonstrates that the lack of labeling of the case with laminin alpha-2antibody is specific and not just due to generalized loss of immunoreactivity of the specimen. Therefore, the diagnosis is CMD caused by deficiency of laminin alpha-2 (or merosin); this should be confirmed by genetic testing for the gene for this protein. There are developmental brain abnormalities that are commonly found in laminin-deficient congenital muscular dystrophy, although they were not identified in the neuroimaging study of this patient. A major clinical differential diagnostic consideration in this patient prior to muscle biopsy was Werdnig-Hoffmann disease, which is infantile spinal muscular atrophy, a motor neuron disease. At present, the best way to diagnose infantile spinal muscular atrophy is by genetic testing performed with a sample of blood. If the blood test is unrevealing, muscle biopsy can be performed. 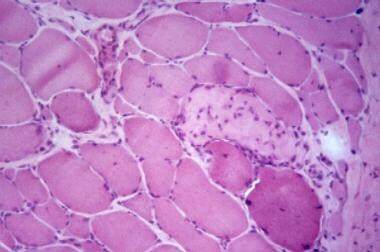 In Werdnig-Hoffmann disease, as in CMD, muscle biopsy demonstrates a range of myofiber sizes. However, unlike CMD, in Werdnig-Hoffmann disease, the largest fibers (see the first image below) tend to cluster. In biopsy samples from patients with Werdnig-Hoffmann, the largest and smallest fibers are both type 1 myofibers (see the second image below); this finding does not occur in CMD. If immunohistochemistry for muscular dystrophy proteins were performed, it would be normal. An important caveat is that these changes in myofiber distribution are generally not present until the infant is several months old. Therefore, when possible, defer biopsy until the infant is age 6 months, or prepare the family for the possibility of the necessity to obtain a second biopsy if findings on the first are not specifically diagnostic. 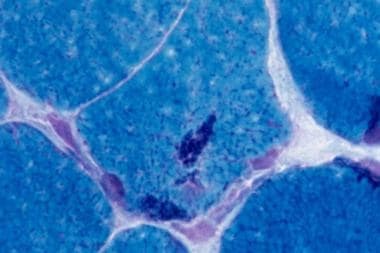 Because Werdnig-Hoffmann disease can currently be diagnosed by genetic testing, it is no longer common practice to obtain a muscle biopsy if this disorder is suspected. Werdnig-Hoffmann disease (infantile spinal muscular atrophy [SMA] I), on hematoxylin and eosin (H&E) cryostat section. The myofibers range from abnormally small to abnormally large. Clustering of the largest fibers (on the right lower area of the image) is a characteristic finding of this disorder. Werdnig-Hoffmann disease, myosin adenosine triphosphatase (ATPase) at pH 4.3. Type 1 myofibers are brown, and type 2 myofibers are pink. The smallest and largest fibers are type 1, and the large type 1 fibers are clustered. These are the characteristic pathologic findings of this disorder. Glycogenoses are inherited inborn errors of glycogen metabolism; 9 of these disorders affect skeletal muscle. 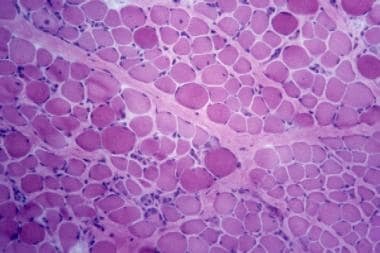 The 2 most commonly encountered by muscle pathologists are type II glycogenosis (acid maltase or alpha glucosidase deficiency) and type V glycogenosis (myophosphorylase deficiency). The first type is characterized by symptoms of weakness and/or cramps during the anaerobic phase of exercise. This syndrome is due to defects in the enzymes required for mobilization of glycogen or abnormalities of glycolytic enzymes that for energy production from metabolism of glucose during exercise, particularly during anaerobic exercise. The second type is characterized by a progressive proximal myopathy without significant exercise-induced symptoms. This syndrome is caused by defective enzymes involved in the glycogen synthetic pathway or for the metabolism of glycogen located in lysosomes that is not in the metabolic pathway for energy production during exercise. A severe, fatal, infantile form, also known as Pompe disease, affects multiple organs, including the heart, liver, kidneys, leukocytes, central nervous system, and skeletal muscle. Glycogen storage is demonstrated in most tissues in this disorder. A juvenile variant presents with weakness affecting the muscles of proximal limbs. In adult-onset acid maltase deficiency, weakness and fatigue occur and early progressive respiratory failure is typical. The age of onset and severity of the clinical presentation are generally inversely correlated with the severity of the enzymatic deficiency; the infantile form is the most severe and usually associated with the lowest levels of residual enzyme activity. Type II glycogenosis, acid maltase deficiency, hematoxylin and eosin (H&E) paraffin section. Several myofibers throughout this sample have numerous clear cytoplasmic vacuoles. The clinical presentation in this case was characteristic of acid maltase deficiency. The diagnosis was subsequently confirmed by genetic testing on cultured fibroblasts from this patient. Acid phosphatase histochemistry. Acid phosphatase is a lysosomal enzyme. Panel A is from a case of adult onset acid maltase deficiency. Two myofibers, indicated by the arrows, exhibit excessive dark red staining that indicates that lysosomes are increased in number and size. 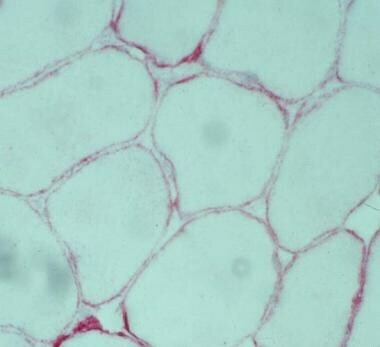 The abnormally increased staining here corresponds to vacuoles within the myofibers that contain excessive glycogen. The majority of the myofibers in the biopsy exhibit normal staining. Panel B is from a case of chloroquine myopathy, with markedly increased red staining in many myofibers, corresponding to the widespread increase in number and size of lysosomes in this case. 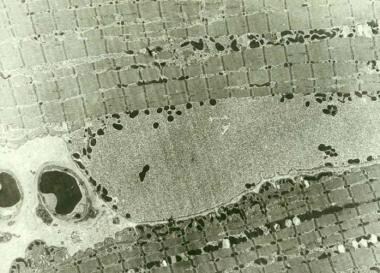 Electron micrograph in Type II glycogenosis, acid maltase deficiency. Huge aggregates of membrane-bound intralysosomal glycogen are observed in this myofiber. Confirming the diagnosis of type II glycogenosis by biochemical assay of the activity of acid maltase from a special sample of skeletal muscle that has been obtained appropriately for this purpose or genetic confirmation of the diagnosis is necessary. If an optional additional fresh specimen, described in the technical section of the article Muscle Biopsy and Clinical and Laboratory Features of Neuromuscular Disease, it can be used for enzyme assay at a laboratory that performs this type of study. The assay can also be performed on cultured fibroblasts or on a sample of urine. It is also possible to identify the specific mutations responsible for producing the disease in an individual. 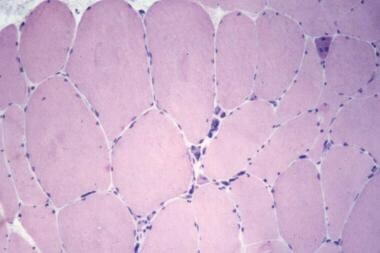 In type V glycogenosis (McArdle disease), due to deficiency of myophosphorylase, the abnormality is restricted to skeletal muscle. The classic presentation is the development of muscle cramps during the anaerobic phase of exercise and episodes of exercise-induced rhabdomyolysis (myofiber necrosis). Venous lactate levels fail to rise during an ischemic forearm exercise test; very few clinicians perform this test, at least partially due to a risk of inducing myofiber necrosis with this test. Type V glycogenosis, myophosphorylase deficiency, hematoxylin and eosin (H&E) frozen section. The myofiber in the central region of the image contains several subsarcolemmal clear vacuoles. Type V glycogenosis, myophosphorylase deficiency, periodic acid-Schiff (PAS) frozen section. Most myofibers in this section contain large vacuoles with bright pink magenta PAS-positive material. These vacuoles correspond to the clear vacuoles seen in a different myofiber in the previous image. Type V glycogenosis, myophosphorylase deficiency, periodic acid-Schiff (PAS) stain with diastase, which digests glycogen. In this photomicrograph, 2 vacuoles in a myofiber originally stained with PAS are empty after treatment with diastase. This finding proves that the material in the vacuole is glycogen. Type V glycogenosis, myophosphorylase deficiency, ultrastructure. A huge pool of free glycogen in the center of the image is in the subsarcolemmal zone of the myofiber seen in the top half of the image. Also note a mild increase in intermyofibrillar glycogen. Evidence of absence of myophosphorylase activity (see the first image below) on special histochemical staining, with normal activity in a simultaneous control specimen (see the second image below). Type V glycogenosis, myophosphorylase deficiency on a frozen section stained for myophosphorylase activity. The myofibers show absence of staining for a product of the activity of myophosphorylase, which establishes the diagnosis. The following image demonstrates the normal control for this stain. 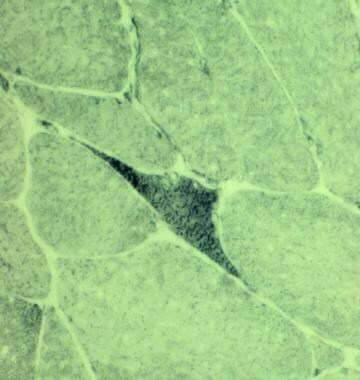 Muscle with normal myophosphorylase activity on a frozen section stained for myophosphorylase activity. This specimen shows the delicate black reaction product formed by myophosphorylase activity. Compare with the previous image, from a patient with myophosphorylase deficiency. Mitochondrial myopathies are disorders with a broad spectrum of clinical presentations due to involvement of a variety of organ systems. These disorders affect organs that are highly dependent upon aerobic metabolism and therefore commonly affect the heart, skeletal muscle, eye, and brain. Renal and gastrointestinal involvement occurs in some cases. Many patients with disorders of mitochondrial function have basal elevation of serum lactate, because a block in oxidative phosphorylation causes slower turning of the Krebs cycle, which then results in decrease conversion of pyruvate to acetyl-CoA. The excess pyruvate that results is converted to lactate. Numerous well-recognized clinical disorders are among this group of diseases, such as Kearns-Sayre syndrome, myoclonus epilepsy with ragged red fibers (MERRF), mitochondrial encephalomyopathy with lactic acidosis and strokelike episodes (MELAS), and Leber hereditary optic neuropathy (LHON). Many of these disorders present with a combination of central nervous system (CNS) disease and myopathy and are referred to as encephalomyopathies. The common etiology underlying the mitochondrial disorders is the presence of mutations that affect mitochondrial function. In some of these disorders, the mutations are in the mitochondrial genome; in others, they are in the nuclear genes that encode mitochondrial proteins. Many of these fairly diverse disorders share a common finding on muscle biopsy: the ragged red fiber (RRF). A ragged red fiber is one with intense peripheral red staining with the Gomori trichrome stain. This red staining corresponds to aggregates of abnormal mitochondria. Ragged red fibers are not found in all mitochondrial disorders, so their absence does not exclude the presence of a mitochondrial disorder. 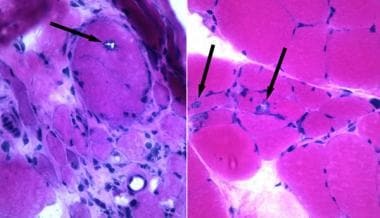 Nonetheless, it is diagnostically important finding when they are present in a muscle biopsy from a patient with a clinical presentation that is suggestive of a mitochondrial disorder. Ragged red fibers can occur as an age-related change in individuals age 50 years and older, so this finding in an older person must be interpreted with caution. On trichrome stain, ragged red fibers have a peripheral rim of red material caused by the subsarcolemmal aggregation of mitochondria (see the following image). Dense peripheral staining for the activity of succinic dehydrogenase (SDH), which is a mitochondrial enzyme involved in the electron transfer chain, can be seen in myofibers corresponding to the ragged red fibers of the trichrome stain (see the blue fibers in the second image below). When visualized with the SDH stain, they are referred to as ragged blue fibers. The presence of many fibers with absence of the activity of cytochrome oxidase (COX), which is complex IV of the respiratory chain enzymes, is a characteristic finding (see the following image). 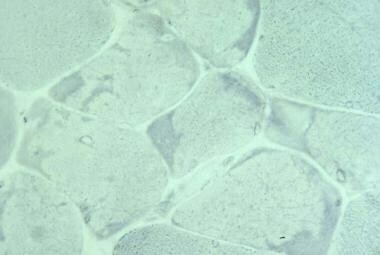 Mitochondrial myopathy, on a cryostat section stained for cytochrome oxidase (COX) activity. In this section, three populations of myofibers can be identified. 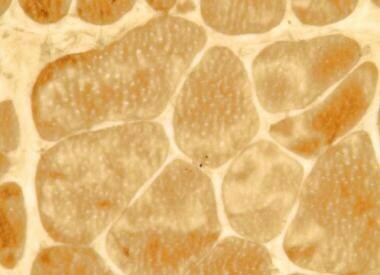 Type 1 myofibers stain the darkest golden brown, and type 2 fibers are lighter tan-brown. The third population consists of pale fibers; these are COX-negative fibers. Combined SDH/COX staining demonstrates that many of the COX-negative fibers are the ragged red fibers (see the image below). Mitochondrial myopathy, combined staining for the activities of cytochrome oxidase (COX) and succinic dehydrogenase (SDH), frozen section. Here, the myofibers that are positive for both COX and SDH are taupe. This results from combining the brown color of the stain for COX with the blue color of the SDH stain. (See the previous image for the color of the COX-positive fibers without the simultaneous SDH stain.) The blue myofibers are those that stain for SDH activity alone because of absence of COX activity. Several blue fibers have subsarcolemmal dense blue stain, so-called "ragged blue" fibers. SDH is a mitochondrial enzyme, so the dark blue rim represents aggregates of mitochondria. 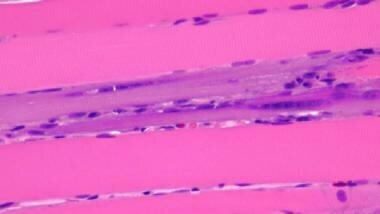 These ragged blue fibers correspond to the ragged red fibers on trichrome stain. All of the blue fibers in this COX/SDH preparation are negative for COX. Mitochondrial myopathy, ultrastructure. A large number of enormous mitochondria can be seen in the intermyofibrillar network of this myofiber, running vertically throughout the center of this image. These mitochondria are larger than entire sarcomeres. Normal mitochondria are much smaller than sarcomeres. 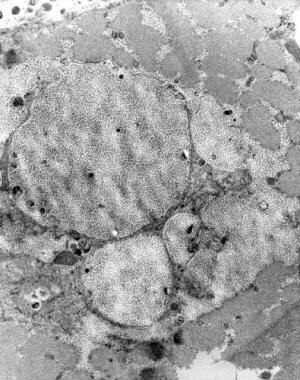 Mitochondrial myopathy, electron micrograph. 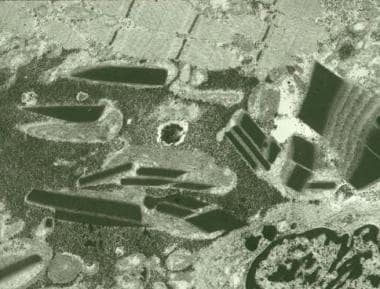 At high magnification, some of the mitochondria in the previous image contain paracrystalline material. They lack the normal configuration of cristae formed by the inner mitochondrial membrane of normal mitochondria. 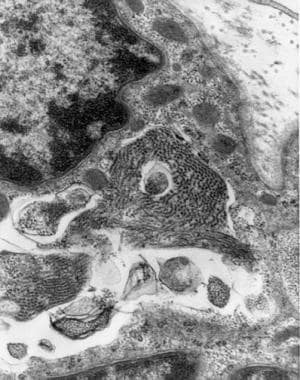 Mitochondrial myopathy, electron micrograph. Many morphologically abnormal mitochondria contain dense crystalline inclusions, which are the dark approximately rectangular structures. Identifying the specific biochemical and genetic abnormalities is possible in many patients with mitochondrial encephalomyopathies if an extra muscle specimen has been properly handled for this purpose. In central core disease, the central region of many myofibers has abnormal structure. 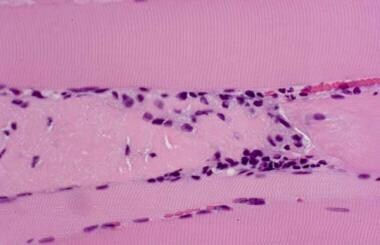 In nemaline myopathy, the fibers contain aggregates of rodlike material seen on trichrome stain. 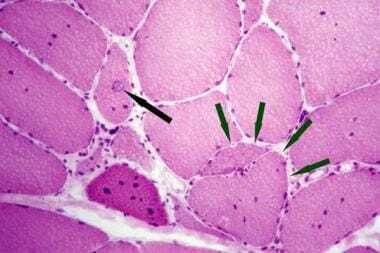 In centronuclear (or myotubular) myopathy, the main pathologic finding is centrally located nuclei in myofibers and fibers that appear immature. In congenital fiber type disproportion, type 1 myofibers are small, and type 2 myofibers are of normal size. Each individual congenital myopathy is probably actually a group of disorders with a common morphology on biopsy. Some have multiple characteristic clinical presentations, rates of progression, and modes of inheritance. Currently, the genetic and molecular bases of the defects are being identified, providing further evidence that they are heterogeneous disorders. Nemaline myopathy is a disorder with both autosomal dominant and recessive modes of inheritance. A severe infantile form exists, and milder forms present later in life. Mutations in 5 different genes (so far) are associated with nemaline myopathy: α-actinin (chromosome 1q42), the nebulin gene (chromosome 22q2), α-tropomyosin 3, β-tropomyosin, and troponin-1. [28, 29, 30, 31] A form of nemaline myopathy is associated with human immunodeficiency virus (HIV) infection. Small numbers of nemaline rods are found relatively frequently in muscle biopsies, so their presence is not specifically diagnostic. They are a normal finding in myofibers located at the myotendinous insertion. 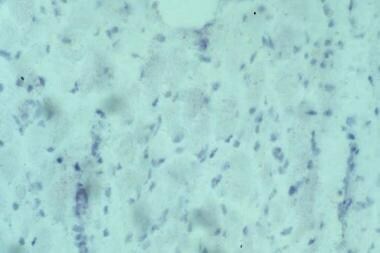 Hematoxylin and eosin (H&E) stain (see the following image) reveals a biopsy that appears normal except for a slight increase in internal nuclei. 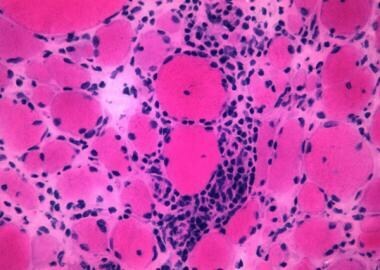 Nemaline myopathy, hematoxylin and eosin (H&E) cryostat section. This biopsy from a patient with nemaline myopathy is remarkable only for a mild increase in internal nuclei on H&E section. Small, faint, clear holes in the myofibers represent slight ice crystal artifact. Trichrome stain (see the first image below) shows the presence of inclusions in many fibers; on high power (see the second image below), these have a rodlike structure. Nemaline myopathy, Gomori trichrome cryostat section. Many fibers contain tiny inclusions. They appear dark blue in this image, but when viewed with a microscope, they are red. 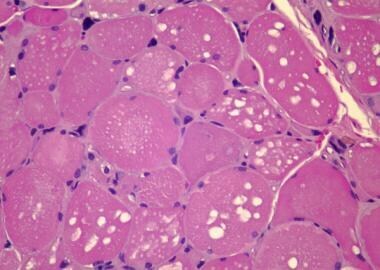 These inclusions are the nemaline rods of this congenital myopathy. Nemaline myopathy on trichrome stain. One myofiber contains two clusters of nemaline rods. They appear blue-red and each individual nemaline rod has a slightly elongated, granular appearance. Myosin ATPase (see the following image) shows a predominance of type 1 myofibers. Nemaline myopathy on myosin adenosine triphosphatase (ATPase) pH 10.5 cryostat section. A marked predominance of type 1 myofibers is present; this is a common occurrence in some congenital myopathies. Type 1 myofibers are pink and type 2 myofibers are brown in this image. Clear holes in many of these fibers are ice crystal artifact. Electron micrograph from a biopsy from a different individual with nemaline myopathy (see the image below) shows that the rods are dense fibrillar structures that extend from the Z bands. Nemaline myopathy, electron micrograph. Many electron-dense fibrillar structures originate in Z bands. This muscle biopsy sample was not clamped before fixation; therefore, the usual orderly ultrastructural architecture of the myofibers was not preserved. Nonetheless, in this patient, the nemaline rods are observed and identified easily. In central core disease, H&E section (see the first image below) shows many myofibers with faint central irregularities of staining. Myosin ATPase (see the second image below) demonstrates that many of the type 1 myofibers have central round areas that do not stain. These are the central cores. They also show absence of staining with the nicotinamide adenine dinucleotide tetrazolium reductase (NADH) stain, not illustrated here. Central core disease on hematoxylin and eosin (H&E) cryostat section. Look closely, particularly at the large fibers at the top of the image; a faint decrease in staining can be detected in the center of some myofibers. These are the central cores, which are almost invisible on H&E section. In this patient, because of atrophy of occasional myofibers, variability of myofiber size is greater than normal. Central core disease on myosin adenosine triphosphatase (ATPase) pH 10.5 cryostat section. Two pale myofibers contain central clear round areas. The central cores are found in type 1 myofibers. 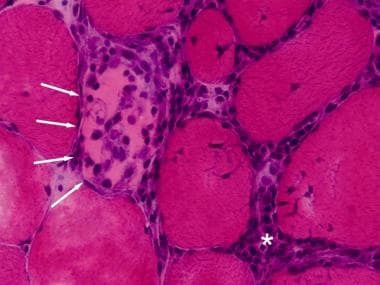 Tubular aggregate myopathy (TAM) is an unusual disorder that is not always classified as a congenital myopathy, but it has such a distinctive histopathologic picture that it is presented in this section. In a rare familial syndrome, affected patients have fluctuating weakness. Tubular aggregates also are found in association with patients with a variety of presentations or disorders, including: progressive proximal weakness, muscle cramps, diabetes mellitus, and alcoholism. H&E (see the image below): Many fibers have large, pale intracytoplasmic inclusions. Periodic acid Schiff (PAS) (see the following image): These inclusions are PAS positive. Tubular aggregate myopathy on periodic acid-Schiff (PAS) frozen section. Many of the myofibers in this image contain fairly large inclusions that are PAS positive. Fiber-typing stain (see the image below), in this case myosin ATPase: In some subgroups of this myopathy, inclusions are typically found only in type 2 myofibers, as illustrated here. This is highly unusual. In most disorders with inclusions that are fiber-type specific, the inclusions are usually found in type 1 myofibers. Tubular aggregate myopathy on myosin adenosine triphosphatase (ATPase) pH 10.5 frozen section. 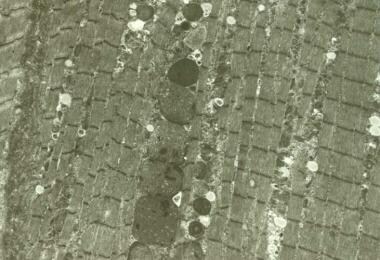 Type 2 myofibers are brown; these contain the inclusions in this case. NADH (see the following image): Inclusions are dark with this stain. Tubular aggregate myopathy, nicotinamide adenine dinucleotide tetrazolium reductase (NADH) frozen section. Many type 2 myofibers, identified by their light staining compared with type 1 fibers, contain inclusions that are dark with this stain. Succinic dehydrogenase (SDH) (see the image below): Tubular aggregate myopathy is the rare disorder in which inclusions are positive with the NADH stain but are negative for SDH. 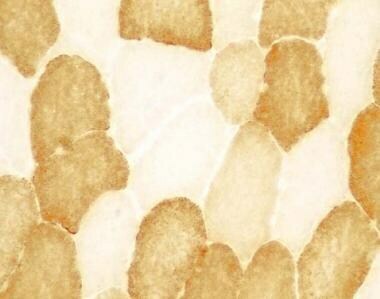 They are negative for the latter stain, because the tubular aggregates are composed of sarcoplasmic reticulum membrane. SDH is found exclusively in mitochondria. Tubular aggregate myopathy, succinic dehydrogenase (SDH) stain. The inclusions, which are the tubular aggregates, can be seen, but they do not stain for SDH. The finding of a nicotinamide adenine dinucleotide tetrazolium reductase (NADH)–positive, SDH-negative inclusion is exceptional and highly suggests this diagnosis. Electron micrograph of tubular aggregates in cross-section (see the following image): Their tubular structure should be appreciated easily in this view. 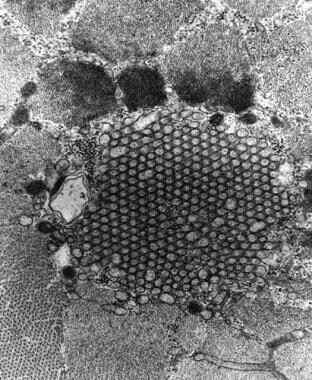 Tubular aggregate myopathy, electron micrograph. Cross-section reveals the tubular nature of the inclusions. A tubular aggregate occupies the central zone of the image. Electron micrograph of tubular aggregates in slightly tangential longitudinal section: The image below demonstrates continuity of the tubules with the lateral sacs of the sarcoplasmic reticulum. Tubular aggregate myopathy, electron micrograph. A tubular aggregate, in slightly tangential section, runs from the upper left to lower right. The middle of the image, on the left side of the aggregate, demonstrates continuity of the tubules with the sarcoplasmic reticulum. For information about sarcoplasmic reticulum, refer to the electron micrograph captions in the article Muscle Biopsy and Clinical and Laboratory Features of Neuromuscular Disease. Dalakas MC. Pathogenesis and therapies of immune-mediated myopathies. Autoimmun Rev. 2012 Jan. 11(3):203-6. [Medline]. Hewer E, Goebel HH. Myopathology of non-infectious inflammatory myopathies - the current status. Pathol Res Pract. 2008. 204(9):609-23. [Medline]. Mammen AL. Autoimmune myopathies: autoantibodies, phenotypes and pathogenesis. Nat Rev Neurol. 2011 Jun. 7(6):343-54. [Medline]. Pestronk A. Acquired immune and inflammatory myopathies: pathologic classification. Curr Opin Rheumatol. 2011 Nov. 23(6):595-604. [Medline]. Dalakas MC. Inflammatory muscle diseases. N Engl J Med. 2015 Apr 30. 372(18):1734-47. [Medline]. Levine SM. Cancer and myositis: new insights into an old association. Curr Opin Rheumatol. 2006 Nov. 18(6):620-4. [Medline]. Engel AG, Arahata K. Monoclonal antibody analysis of mononuclear cells in myopathies. II: Phenotypes of autoinvasive cells in polymyositis and inclusion body myositis. Ann Neurol. 1984 Aug. 16(2):209-15. [Medline]. Arahata K, Engel AG. Monoclonal antibody analysis of mononuclear cells in myopathies. I: Quantitation of subsets according to diagnosis and sites of accumulation and demonstration and counts of muscle fibers invaded by T cells. Ann Neurol. 1984 Aug. 16(2):193-208. [Medline]. Arahata K, Engel AG. Monoclonal antibody analysis of mononuclear cells in myopathies. III: Immunoelectron microscopy aspects of cell-mediated muscle fiber injury. Ann Neurol. 1986 Feb. 19(2):112-25. [Medline]. Emslie-Smith AM, Engel AG. Microvascular changes in early and advanced dermatomyositis: a quantitative study. Ann Neurol. 1990 Apr. 27(4):343-56. [Medline]. Needham M, Mastaglia FL. Inclusion body myositis: current pathogenetic concepts and diagnostic and therapeutic approaches. Lancet Neurol. 2007 Jul. 6(7):620-31. [Medline]. Dimachkie MM, Barohn RJ. Inclusion body myositis. Curr Neurol Neurosci Rep. 2013 Jan. 13(1):321. [Medline]. Mammen AL, Pak K, Williams EK, et al. Rarity of anti-3-hydroxy-3-methylglutaryl-coenzyme A reductase antibodies in statin users, including those with self-limited musculoskeletal side effects. Arthritis Care Res (Hoboken). 2012 Feb. 64(2):269-72. [Medline]. Mammen AL. Toxic myopathies. Continuum (Minneap Minn). 2013 Dec. 19(6 Muscle Disease):1634-49. [Medline]. Mohassel P, Mammen AL. Statin-associated autoimmune myopathy and anti-HMGCR autoantibodies. Muscle Nerve. 2013 Oct. 48(4):477-83. [Medline]. Narayanaswami P, Weiss M, Selcen D, et al. Evidence-based guideline summary: diagnosis and treatment of limb-girdle and distal dystrophies: report of the guideline development subcommittee of the American Academy of Neurology and the practice issues review panel of the American Association of Neuromuscular & Electrodiagnostic Medicine. Neurology. 2014 Oct 14. 83(16):1453-63. [Medline]. van Westering TL, Betts CA, Wood MJ. Current understanding of molecular pathology and treatment of cardiomyopathy in duchenne muscular dystrophy. Molecules. 2015 May 15. 20(5):8823-55. [Medline]. Strehle EM, Straub V. Recent advances in the management of Duchenne muscular dystrophy. Arch Dis Child. 2015 Dec. 100(12):1173-7. [Medline]. Hoffman EP, Brown RH Jr, Kunkel LM. Dystrophin: the protein product of the Duchenne muscular dystrophy locus. Cell. 1987 Dec 24. 51(6):919-28. [Medline]. Koenig M, Hoffman EP, Bertelson CJ, Monaco AP, Feener C, Kunkel LM. Complete cloning of the Duchenne muscular dystrophy (DMD) cDNA and preliminary genomic organization of the DMD gene in normal and affected individuals. Cell. 1987 Jul 31. 50(3):509-17. [Medline]. Kissel JT, Mendell JR. 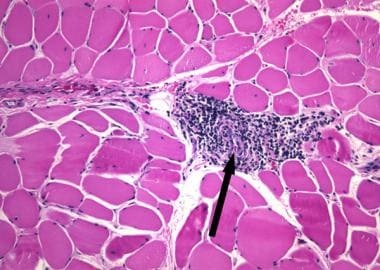 Muscular dystrophy: historical overview and classification in the genetic era. Semin Neurol. 1999. 19(1):5-7. [Medline]. Taylor RW, Schaefer AM, Barron MJ, McFarland R, Turnbull DM. The diagnosis of mitochondrial muscle disease. Neuromuscul Disord. 2004 Apr. 14(4):237-45. [Medline]. DiMauro S, Hirano M. Mitochondrial encephalomyopathies: an update. Neuromuscul Disord. 2005 Apr. 15(4):276-86. [Medline]. Leonard JV, Schapira AH. Mitochondrial respiratory chain disorders I: mitochondrial DNA defects. Lancet. 2000 Jan 22. 355(9200):299-304. [Medline]. Leonard JV, Schapira AH. Mitochondrial respiratory chain disorders II: neurodegenerative disorders and nuclear gene defects. Lancet. 2000 Jan 29. 355(9201):389-94. [Medline]. Michele DE, Albayya FP, Metzger JM. A nemaline myopathy mutation in alpha-tropomyosin causes defective regulation of striated muscle force production. J Clin Invest. 1999 Dec. 104(11):1575-81. [Medline]. [Full Text]. Pelin K, Hilpela P, Donner K, et al. Mutations in the nebulin gene associated with autosomal recessive nemaline myopathy. Proc Natl Acad Sci U S A. 1999 Mar 2. 96(5):2305-10. [Medline]. [Full Text]. Wallgren-Pettersson C, Pelin K, Hilpela P, et al. Clinical and genetic heterogeneity in autosomal recessive nemaline myopathy. Neuromuscul Disord. 1999 Dec. 9(8):564-72. [Medline]. Lynch PJ, Tong J, Lehane M, et al. A mutation in the transmembrane/luminal domain of the ryanodine receptor is associated with abnormal Ca2+ release channel function and severe central core disease. Proc Natl Acad Sci U S A. 1999 Mar 30. 96(7):4164-9. [Medline]. [Full Text]. 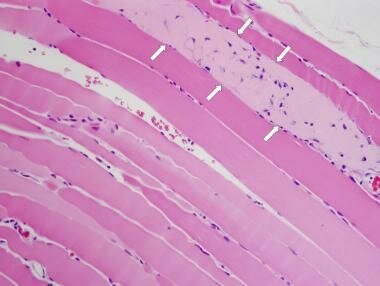 Carpenter S, Karpati G. Pathology of Skeletal Muscle. 2nd. ed. New York, NY: Oxford University Press; 2001. Dubowitz V. Muscle Disorders in Childhood. 2nd ed. London: WB Saunders; 1995. Engel AG, Franzini-Armstrong C. Myology: Basic and Clinical. 3rd ed. New York, NY: McGraw-Hill; 2004. Dermatomyositis, immunofluorescence for the membrane attack complex of complement (MAC). The bright ring of yellow-green fluorescence at the center represents MAC in the wall of a microvessel. This finding is usually not present after treatment with steroids. 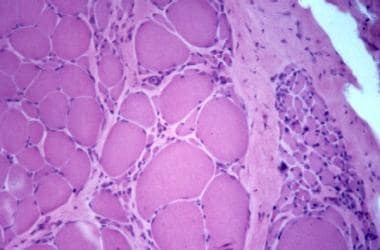 Perifascicular atrophy, in which atrophic fibers are located at the periphery of the muscle fascicle, as observed in the 2 fascicles in this photograph, is one of the characteristic histopathologic findings that support a diagnosis of dermatomyositis. This muscle specimen is from debridement of a traumatic rupture of a fibularis longus muscle (formerly known as peroneus longus) due to an accident during a baseball game. Before the injury, the patient had no evidence of any underlying neuromuscular disorder. The biopsy findings are consistent with muscle necrosis and reactive change to the necrosis. 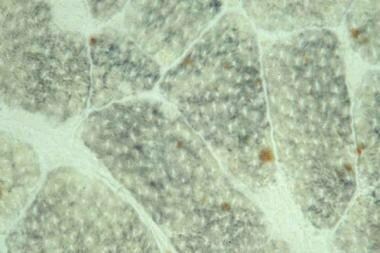 The accompanying photograph is from an immunohistochemical stain using an antibody to dystrophin. It shows many fibers that are negative for dystrophin and a cluster of fibers in the center of the field that have a brown rim, indicating that they do produce dystrophin. The presence of these revertant fibers is expected in Duchenne dystrophy. It is the result of a small number of fibers that have a second mutation in the large dystrophin gene that restores the reading frame and permits production of dystrophin in these fibers. I would like to thank all of the clinicians and surgeons who allow me to share in the care of their patients with neuromuscular disorders, Karin Thompson and the other technologists whose conscientiousness and expertise in handling and processing the biopsies are essential to the successful evaluation of the patients, and Dr. Nancy Peress, who generously devoted years of her life to training me in neuropathology and subsequently working with me as a treasured colleague, advisor, and friend. Does Coenzyme Q10 Supplementation Mitigate Statin-Associated Muscle Symptoms?